Apple has recently made several important announcements about the electricity behind its “iCloud”, significantly increasing its ambition for the amount of clean energy powering its data centres by saying they would be “100% Renewable,” including a doubling of the amount of solar power attached to its North Carolina facility. Apple’s chief financial officer, Peter Oppenheimer, said that Apple will set a new bar for the sector by making all three of Apple’s current data centres “coal free” by 2013. This new ambition to be “coal free” is welcome news for the 125 million current iCloud users2, and represents a significant improvement in Apple’s energy choices. 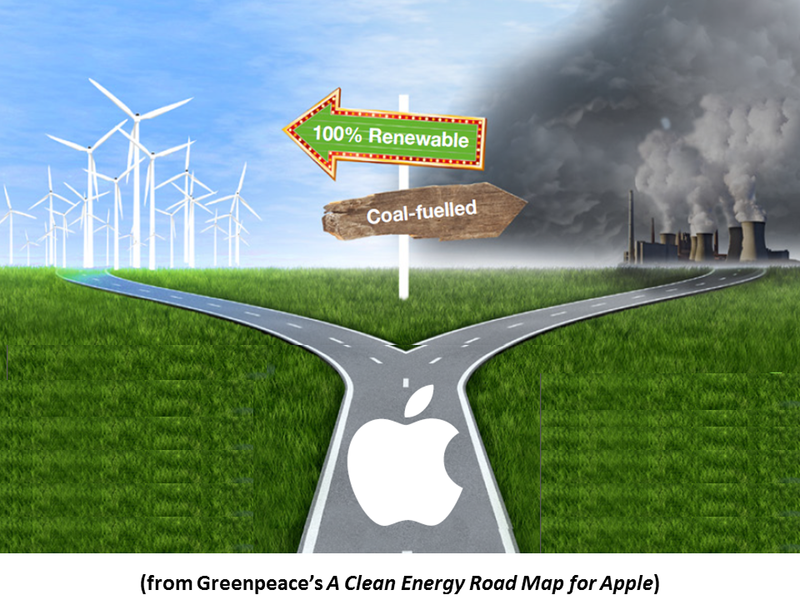 However, many details and questions remain about how Apple will achieve its 100% renewable goal from the public dialogue Greenpeace International has had with the company. Two of Apple’s three current data centres operate in regions that are 50-60% coal powered, and will require significant new investment or a clear decision by Apple to buy electricity from cleaner sources in order to be considered coal free. Such changes for the electricity supply chain for Apple’s data centre in North Carolina in particular are not likely to occur overnight. 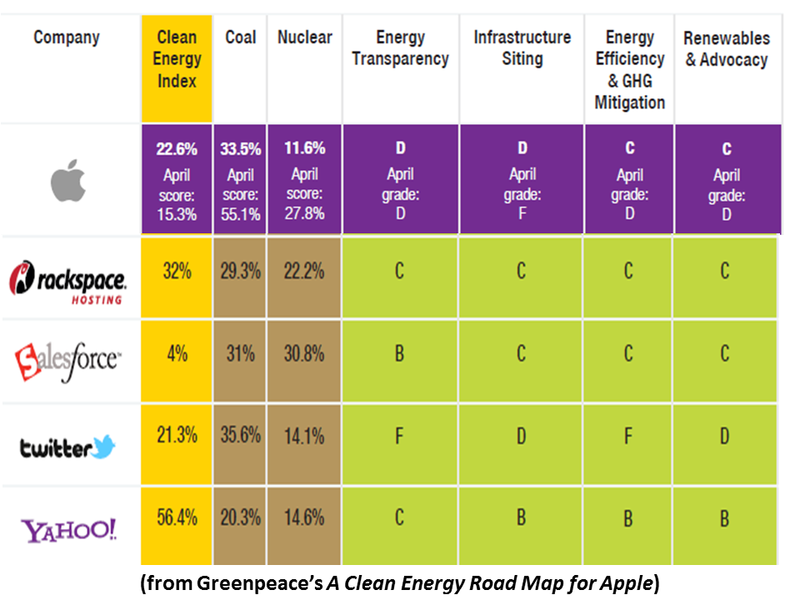 Greenpeace International is rescoring Apple now because of its recent ambitious and public commitments to clean energy. 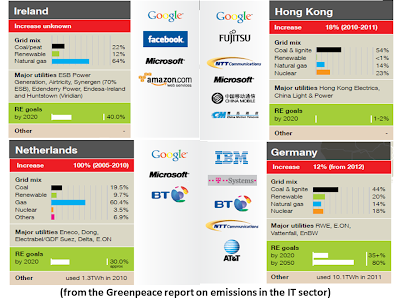 In a subsequent report in 2012, Greenpeace International will also re-evaluate Microsoft and Amazon in light of any action – or inaction – those companies have taken to clean up the energy sources powering their cloud services. Energy scores in the Company Scorecard have been updated from the April release of the “How Clean is Your Cloud?” report to reflect data from the latest 2012 EPA information on state energy mixes.3 We have not updated the letter grades or key sustainability criteria for companies other than Apple. 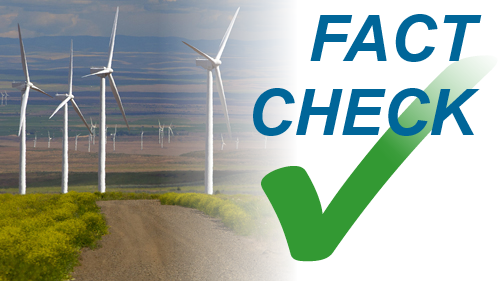 • Choose a renewable-powered local utility for its Oregon data centre, not buy renewable energy credits from coal-powered Pacific Power. 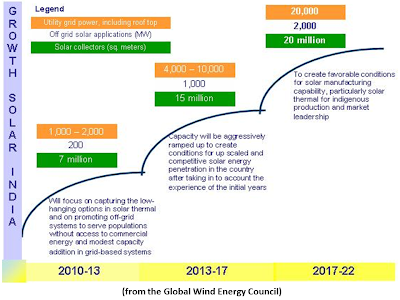 • Use renewable electricity from onsite generation to directly power its North Carolina facility, and use grid power solely for backup, rather than selling its renewable electricity to Duke Energy. 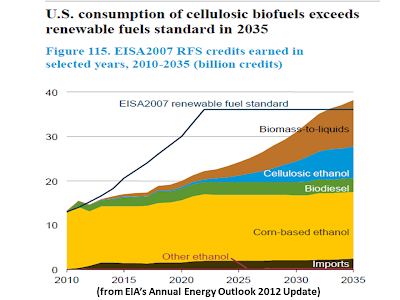 • Secure a sustainable source of biogas to directly power its fuel cells for North Carolina. 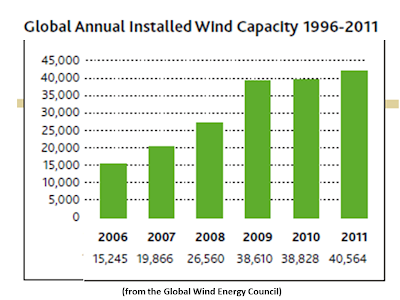 • Retire renewable energy credits from electricity generated onsite in North Carolina. 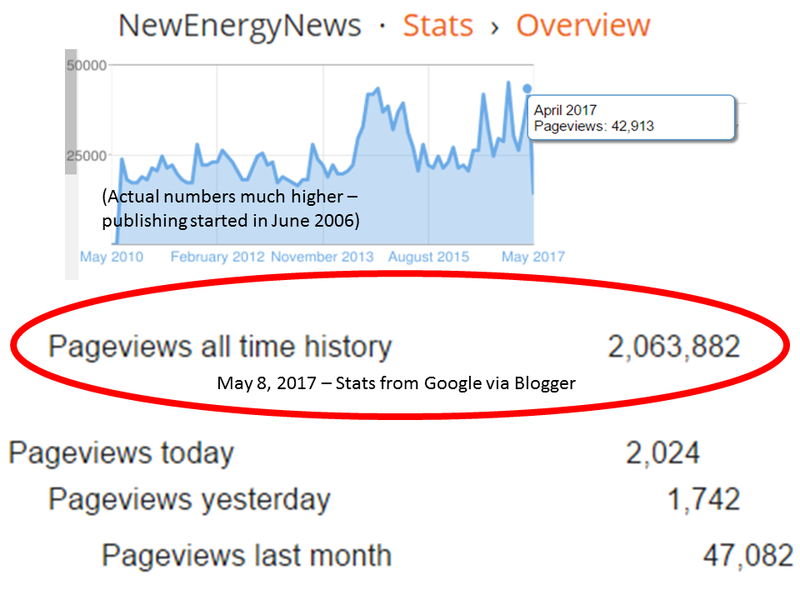 • Invest directly in new renewable energy generation in North Carolina rather than buying renewable credits to “green” Duke Energy’s dirty electricity. 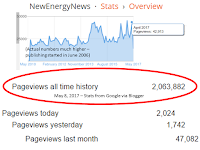 • Demand Duke Energy eliminate its mountaintop coal removal operations from Apple’s electricity supply chain, and demand that Duke invest in new renewable energy generation capacity, not retrofitting and extending the lifetime of dirty coal plants. 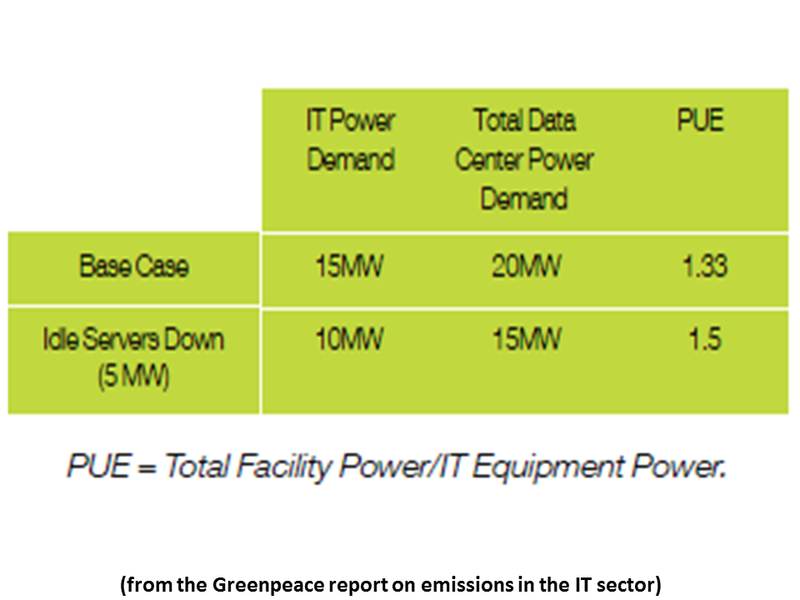 • Adopt a data centre siting policy that prioritises access to renewable energy for any future iCloud data centres. Ultimately, if Apple wants to get serious about its commitment to a coal-free iCloud, the most important thing it can do is to use its buying leverage with Duke Energy and other utilities to push for cleaner electricity options. 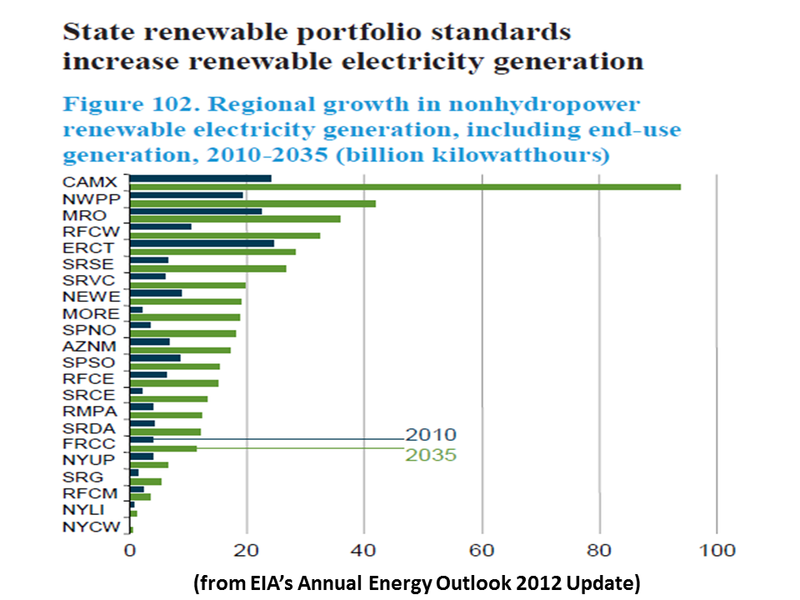 Currently, Duke Energy’s investment plans call for continued reliance on coal and nuclear power, with less than 4% of the electricity it generates in North Carolina coming from renewable energy by 2030. Apple has the ability to bend that trajectory toward cleaner sources of power. Ultimately, if Apple is serious about its commitment to a coal-free iCloud, the most important thing the company can do is to use its buying leverage with Duke to push for cleaner energy options. 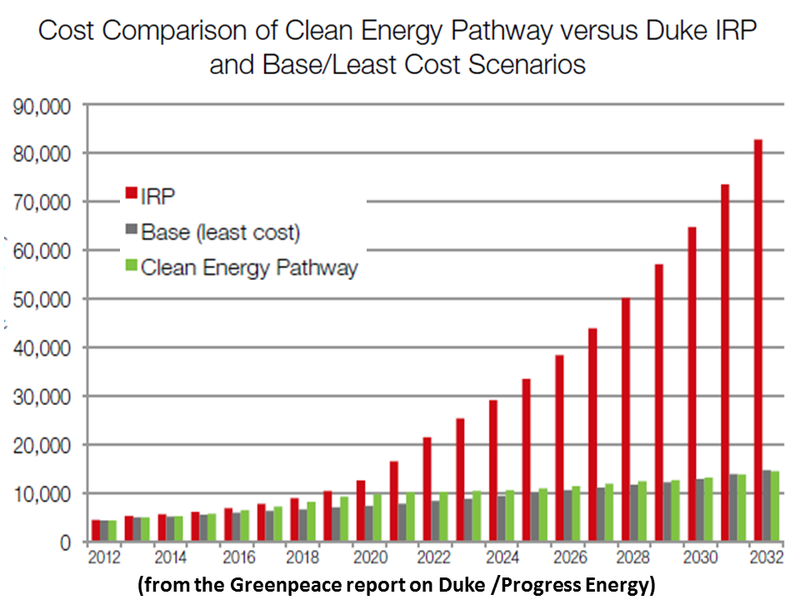 Currently, Duke’s investment plans call for continued reliance on coal and nuclear power, with less than 4% of the electricity coming from renewable energy in North Carolina by 2030.24 If Duke made the right investments today, North Carolina could be on a pathway to be 100% renewable and coal-free by 2030. Apple should start by explicitly asking Duke to cease burning coal from mountaintop removal mining, the most destructive form of coal mining for ecosystems and communities in Appalachia. 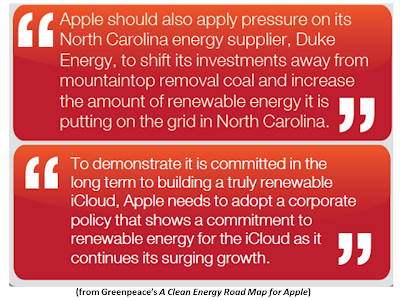 Pressuring Duke to phase out mountaintop removal mining, decrease its dependence on coal, and significantly increase renewable electricity in North Carolina is the long-term solution for Apple to achieve its ambitious “coal free” goal at its Maiden data centre. That would be good not only for Apple, but for the citizens of North Carolina, and particularly for communities in North Carolina and Appalachia suffering from the impacts of coal mining and burning. 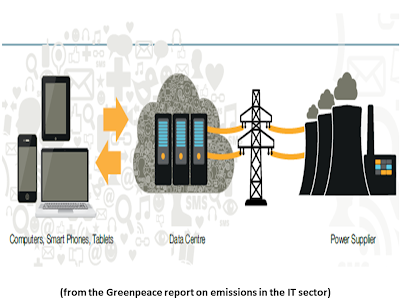 (1) Adopt a siting policy that expresses a preference to build data centres where the grid is already clean, as Facebook has done.25 A siting policy would be a clear indication of lasting renewable leadership and would send a clear signal to the marketplace that the cloud should be powered by renewable energy. 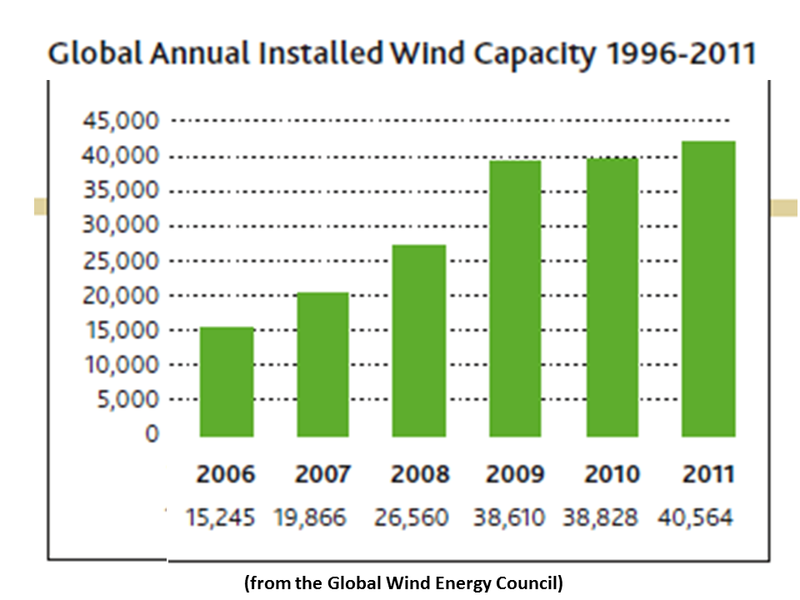 (2) Set a steadily increasing renewable energy goal – one that does not rely on the use of RECs – for Apple’s data centre infrastructure as it continues to grow. 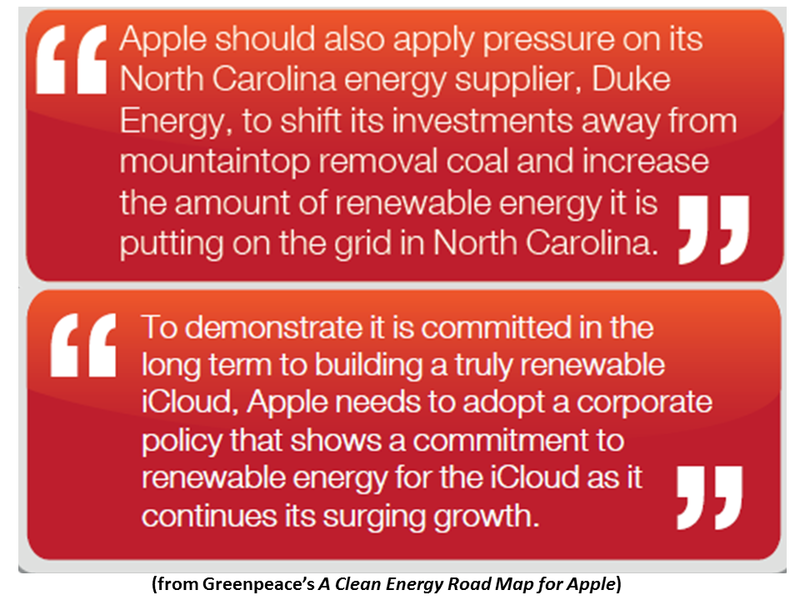 While RECs allow Apple to quickly pay for the right to claim its iCloud is renewable powered, the reality on the ground will continue to reflect that the iCloud is increasing demand for dirty energy, particularly in North Carolina where nearby plants are powered by mountaintop removal coal. 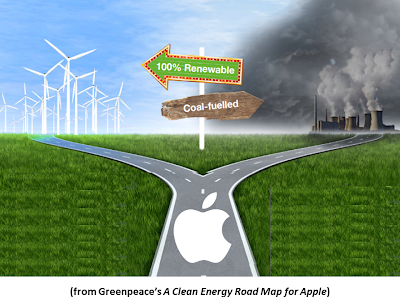 Greenpeace will continue to work with Apple and Apple’s customers until the company develops a commitment that all of its current and future data centres move toward clean energy, not coal. While Apple has made impressive recent strides in investing in on-site renewable energy, it still has a lot of work to do to make good on this commitment. If it does that, and develops a policy that promises the same for its future growth, Greenpeace – and, more importantly, Apple’s customers – will recognise the company for becoming a leader in the new clean energy economy. 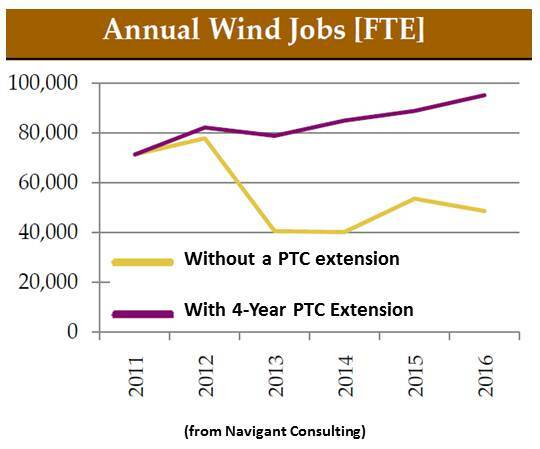 “…[T]he Department of Commerce (Commerce) announced its affirmative preliminary determinations in the antidumping duty (AD) investigations of imports of utility scale wind towers from the People’s Republic of China (China) and the Socialist Republic of Vietnam (Vietnam)…[D]umping occurs when a foreign company sells a product in the United States at less than fair value. 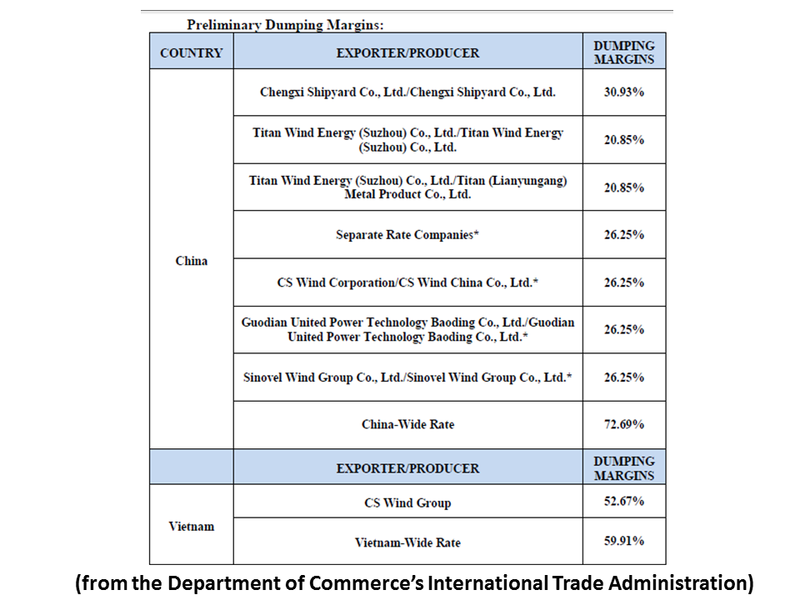 “…Commerce preliminarily determined…[in] the China investigation… Chengxi Shipyard Co., Ltd. and Titan Wind Energy (Suzhou) Co., Ltd. received preliminary dumping margins of 30.93 percent and 20.85 percent…Three other exporters qualified for a separate rate of 26.25 percent. 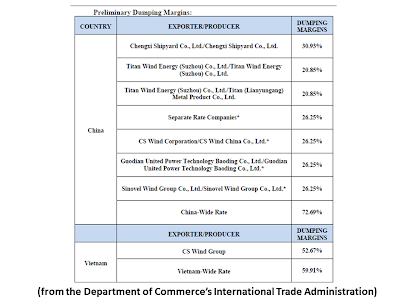 All other Chinese producers/exporters received a preliminary dumping margin of 72.69 percent…In the Vietnam investigation, mandatory respondent, CS Wind Corporation and CS Wind Vietnam Co. Ltd….received a preliminary dumping margin of 52.67 percent. All other Vietnamese producers/exporters received a preliminary dumping margin of 59.91 percent." PHEV GO, EV NO Plug-in hybrid sales soar; all-electric cars stay in low gear; Analysts say electric cars' limited range and higher prices, as well as the lack of a widespread public charging infrastructure, have hurt the appeal of the vehicles. 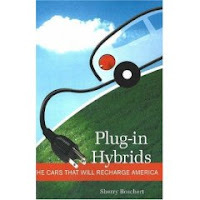 But sales of plug-in hybrids — vehicles that can travel miles on battery power before a traditional gasoline engine kicks in — are soaring. 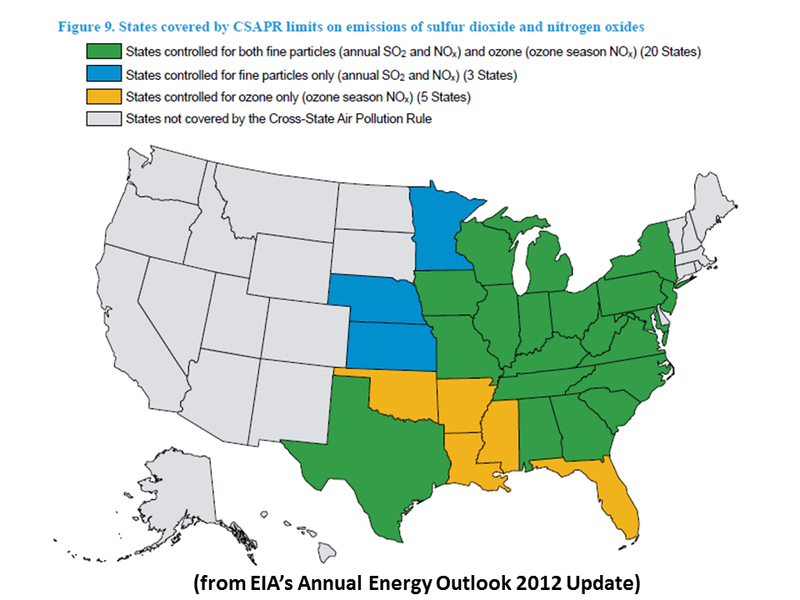 • The Mercury and Air Toxics Standards (MATS) issued by the EPA in December 2011 was incorporated. 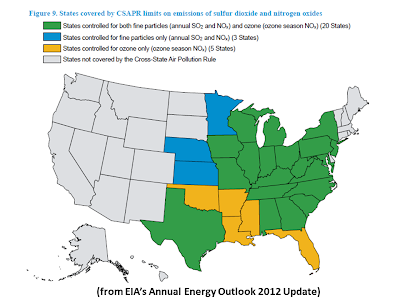 • The long-term macroeconomic projection was revised, based on the November 2011 long-term projection from IHS Global Insights, Inc.
• The Cross-State Air Pollution Rule (CSAPR), which was included in the Early Release Reference case, was kept in the final Reference case. In December 2011, a District Court delayed the rule from going into effect while in litigation. 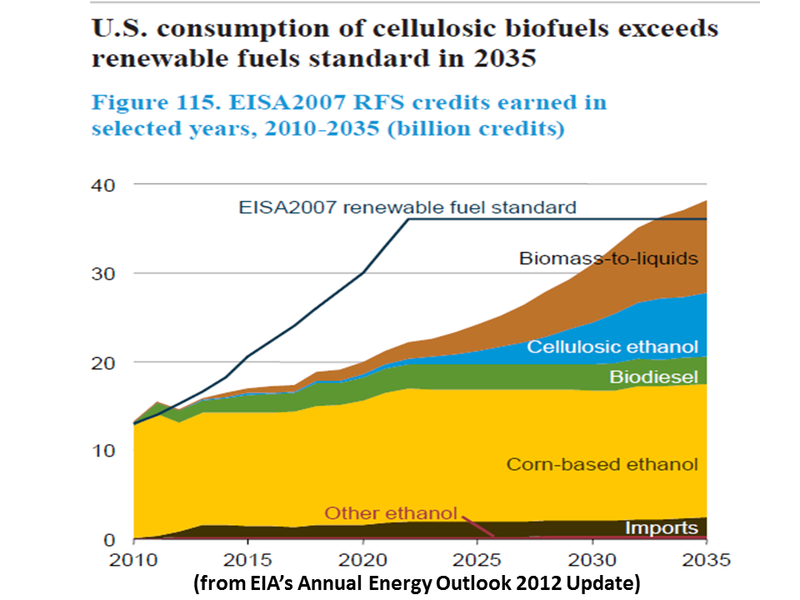 • The California Low Carbon Fuel Standard (LCFS) was removed from the final Reference case, given the Federal court ruling in December 2011 that found some aspects of it to be unconstitutional. 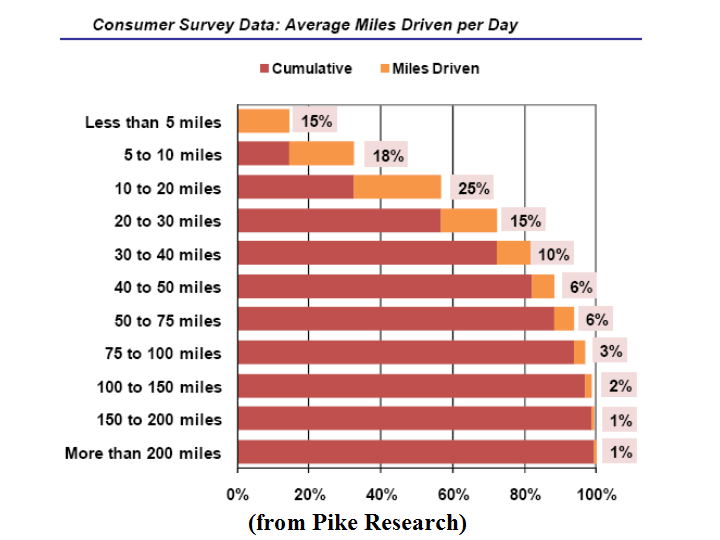 • Historical data and equations for the transportation sector were revised to reflect revised data from NHTSA and FHWA. • A new cement model was incorporated in the industrial sector. 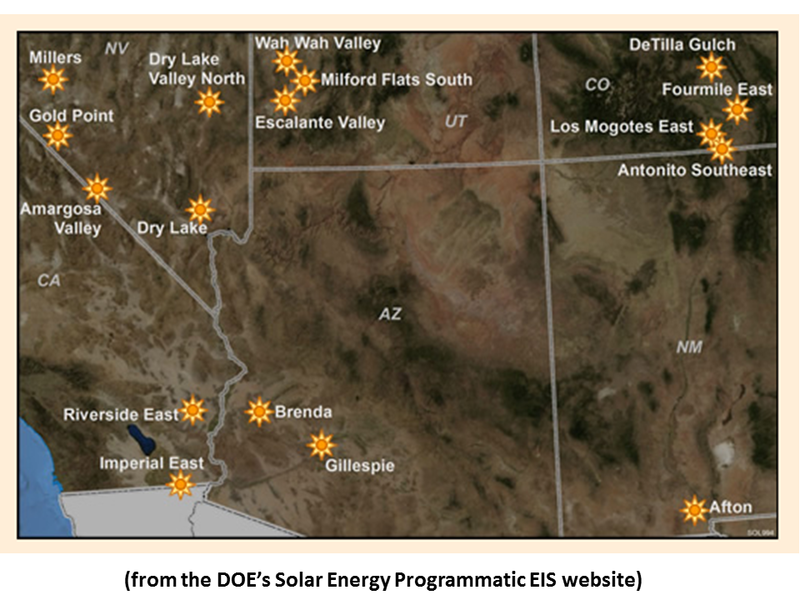 • Photovoltaic capacity estimates for recent historical years (2009 and 2010) were updated to line up more closely with Solar Energy Industries Association (SEIA) and Interstate Renewable Energy Council (IREC) reports. • Gulf of Mexico production data were revised downward to reflect data reported by the Bureau of Ocean Energy Management more closely. 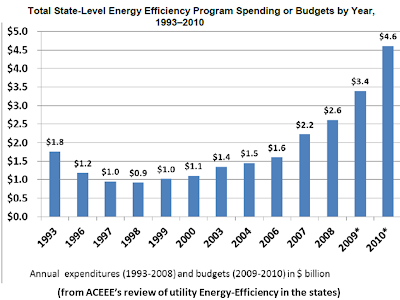 • Data in the electricity model were revised to reflect 2009 electric utility financial data (electric utility plant in service, operations and maintenance costs, etc.) 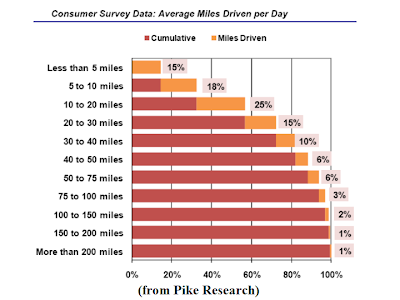 and refine the breakdown of associated costs between the generation, transmission, and distribution components. • Higher capital costs for fabric filters were adopted in the analysis of MATS, based on EPA data. • Reservoir-level oil data were updated to improve the API gravity and sulfur content data elements. • The assumed volume of natural gas used at export liquefaction facilities was revised. Future analyses using the AEO2012 Reference case will start from the version of the Reference case released with this complete report. Domestic crude oil production has increased over the past few years, reversing a decline that began in 1986. 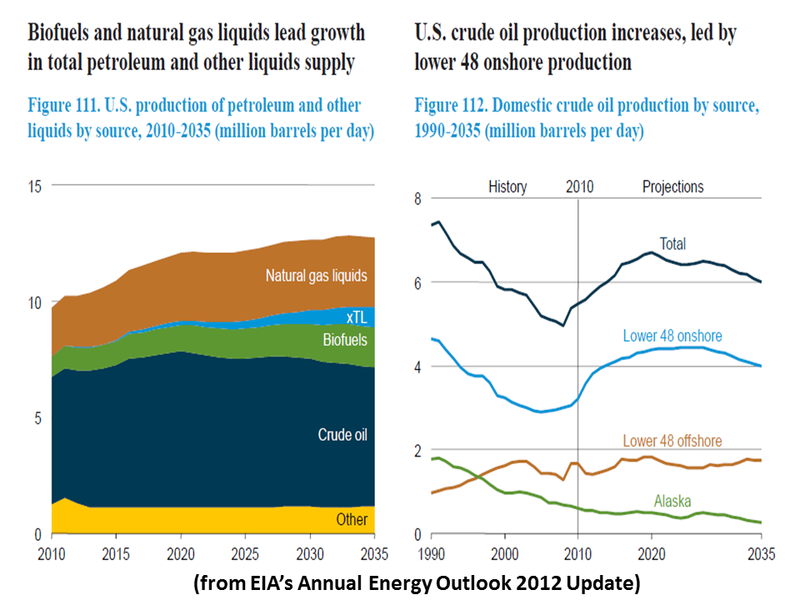 U.S. crude oil production increased from 5.0 million barrels per day in 2008 to 5.5 million barrels per day in 2010. Over the next 10 years, continued development of tight oil, in combination with the ongoing development of offshore resources in the Gulf of Mexico, pushes domestic crude oil production higher. 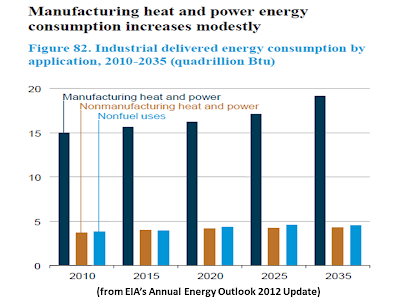 Because the technology advances that have provided for recent increases in supply are still in the early stages of development, future U.S. crude oil production could vary significantly, depending on the outcomes of key uncertainties related to well placement and recovery rates. 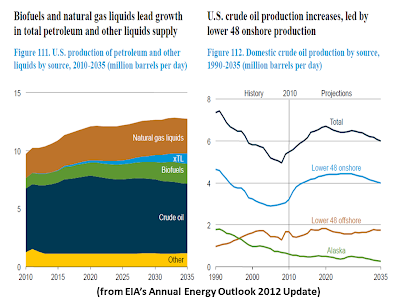 Those uncertainties are highlighted in this Annual Energy Outlook’s “Issues in focus” section, which includes an article examining impacts of uncertainty about current estimates of the crude oil and natural gas resources. 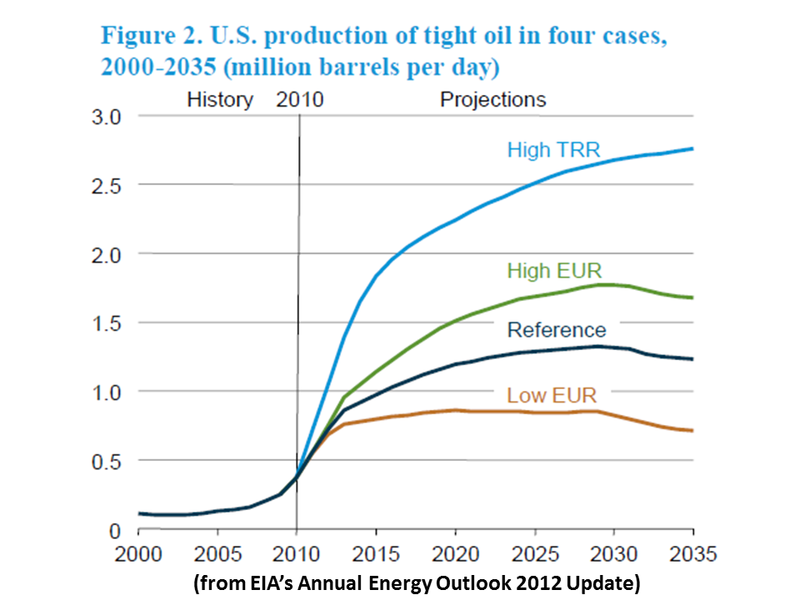 The AEO2012 projections considering variations in these variables show total U.S. crude oil production in 2035 ranging from 5.5 million barrels per day to 7.8 million barrels per day, and projections for U.S. tight oil production from eight selected plays in 2035 ranging from 0.7 million barrels per day to 2.8 million barrels per day (Figure 2). 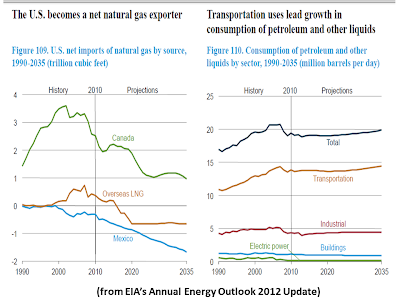 U.S. dependence on imported petroleum and other liquids declines in the AEO2012 Reference case, primarily as a result of rising energy prices; growth in domestic crude oil production to more than 1 million barrels per day above 2010 levels in 2020; an increase of 1.2 million barrels per day crude oil equivalent from 2010 to 2035 in the use of biofuels, much of which is produced domestically; and slower growth of energy consumption in the transportation sector as a result of existing corporate average fuel economy standards. 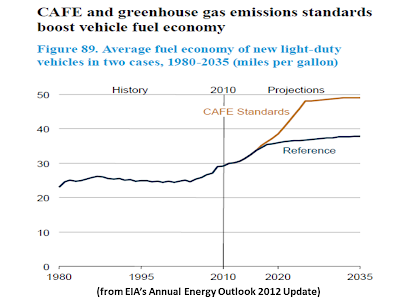 Proposed fuel economy standards covering vehicle model years (MY) 2017 through 2025 that are not included in the Reference case would further reduce projected need for liquid imports. 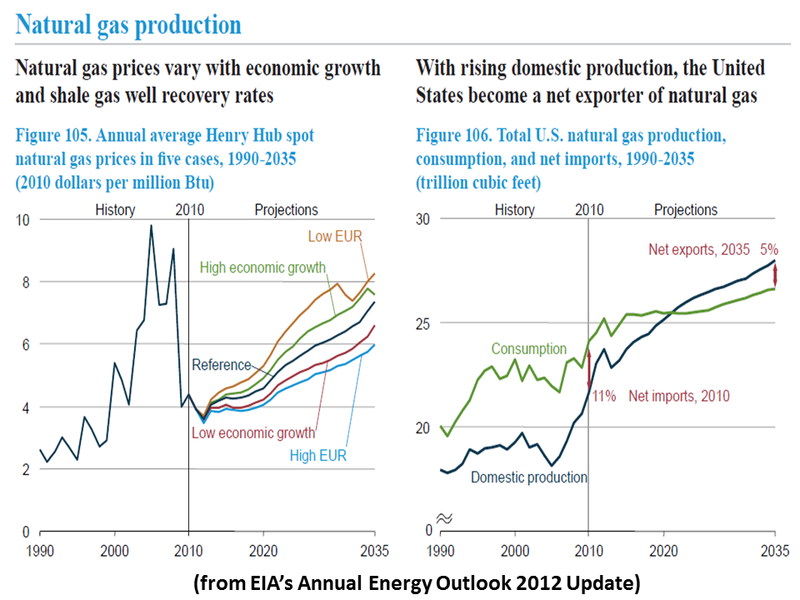 Much of the growth in natural gas production in the AEO2012 Reference case results from the application of recent technological advances and continued drilling in shale plays with high concentrations of natural gas liquids and crude oil, which have a higher value than dry natural gas in energy equivalent terms. 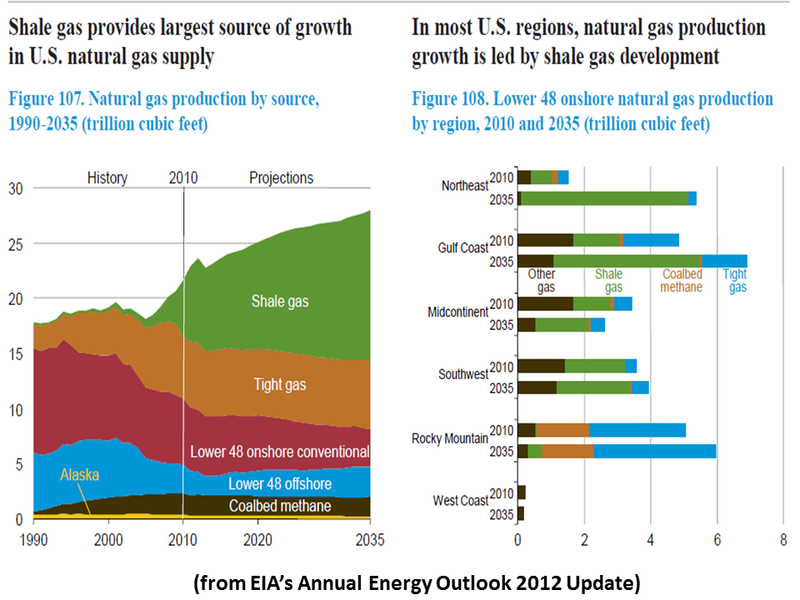 Shale gas production increases in the Reference case from 5.0 trillion cubic feet per year in 2010 (23 percent of total U.S. dry gas production) to 13.6 trillion cubic feet per year in 2035 (49 percent of total U.S. dry gas production). 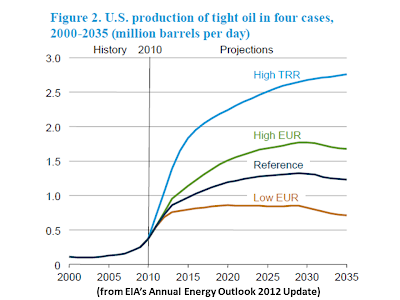 As with tight oil, when looking forward to 2035, there are unresolved uncertainties surrounding the technological advances that have made shale gas production a reality. The potential impact of those uncertainties results in a range of outcomes for U.S. shale gas production from 9.7 to 20.5 trillion cubic feet per year when looking forward to 2035. 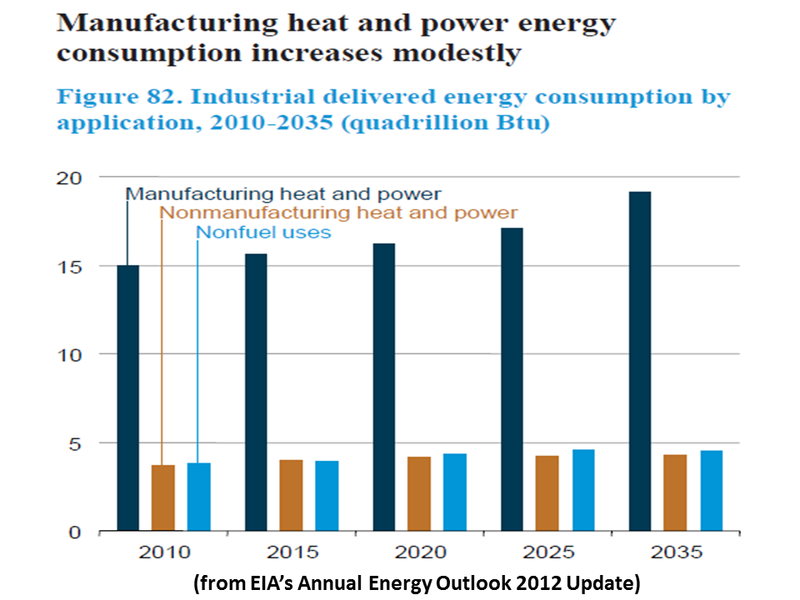 As a result of the projected growth in production, U.S. natural gas production exceeds consumption early in the next decade in the Reference case (Figure 4). 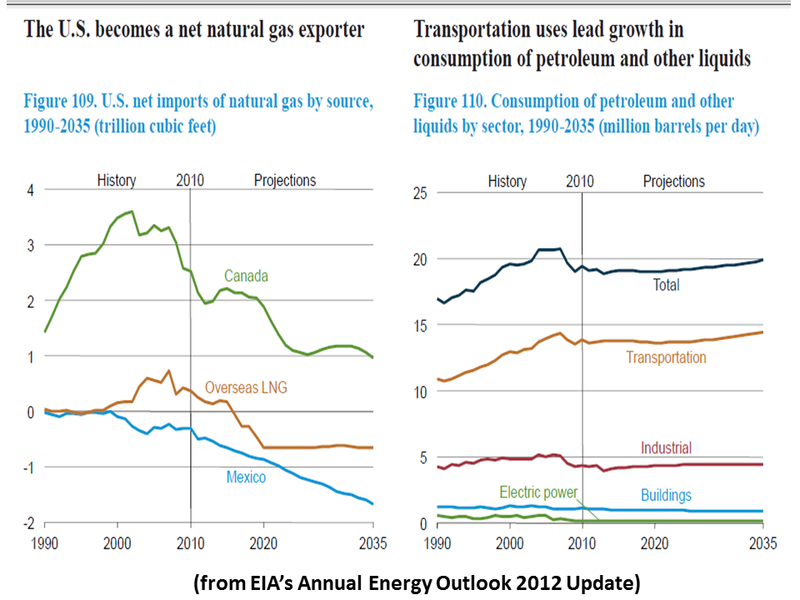 The outlook reflects increased use of liquefied natural gas in markets outside North America, strong growth in domestic natural gas production, reduced pipeline imports and increased pipeline exports, and relatively low natural gas prices in the United States. 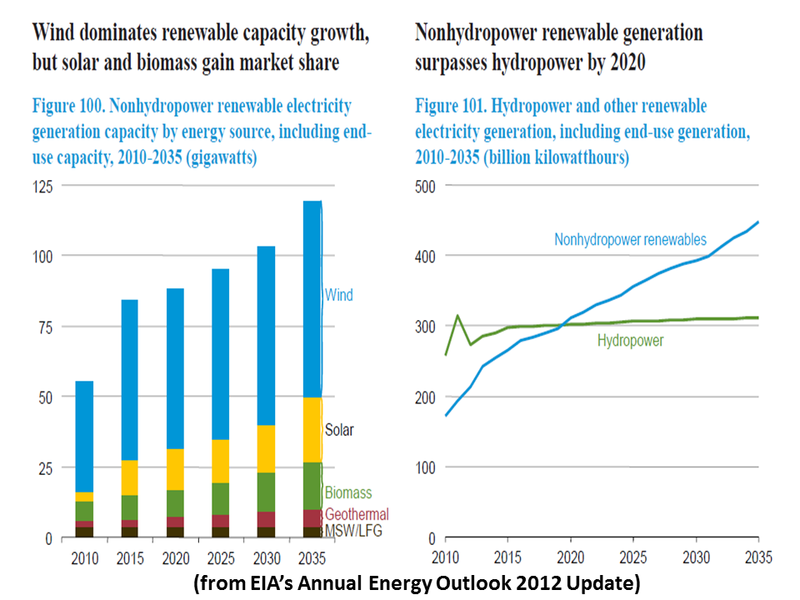 In the Reference case, the natural gas share of electric power generation increases from 24 percent in 2010 to 28 percent in 2035, while the renewables share grows from 10 percent to 15 percent. In contrast, the share of generation from coal-fired power plants declines. The historical reliance on coal-fired power plants in the U.S. electric power sector has begun to wane in recent years. 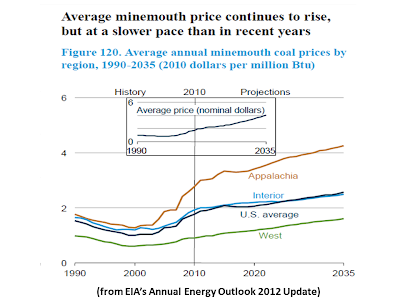 Over the next 25 years, the share of electricity generation from coal falls to 38 percent, well below the 48-percent share seen as recently as 2008, due to slow growth in electricity demand, increased competition from natural gas and renewable generation, and the need to comply with new environmental regulations. 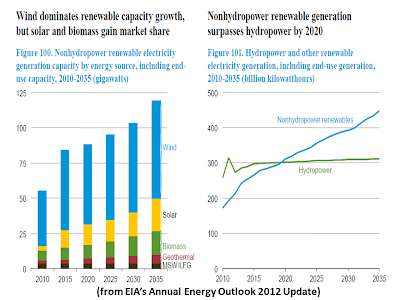 Although the current trend toward increased use of natural gas and renewables appears fairly robust, there is uncertainty about the factors influencing the fuel mix for electricity generation. 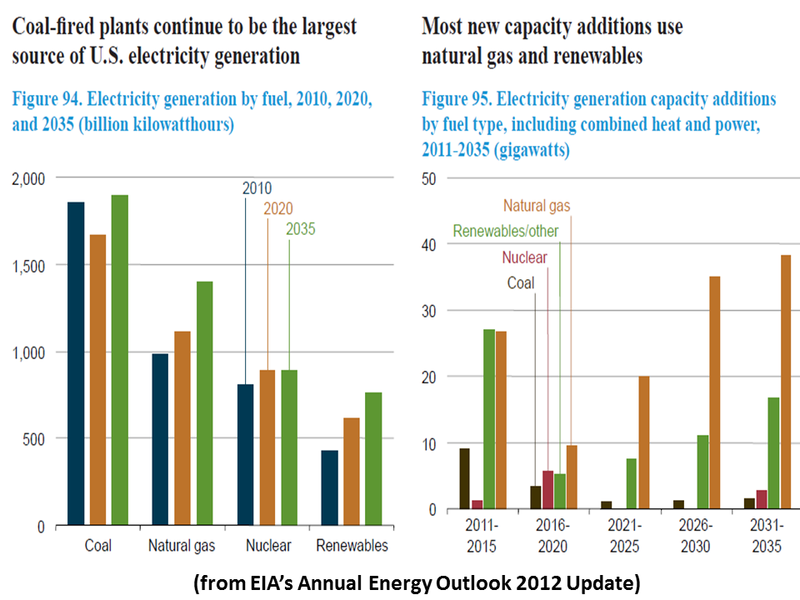 AEO2012 includes several cases examining the impacts on coal-fired plant generation and retirements resulting from different paths for electricity demand growth, coal and natural gas prices, and compliance with upcoming environmental rules. While the Reference case projects 49 gigawatts of coal-fired generation retirements over the 2011 to 2035 period, nearly all of which occurs over the next 5 years, the range for cumulative retirements of coal-fired power plants over the projection period varies considerably across the alternative cases (Figure 5), from a low of 34 gigawatts (11 percent of the coal-fired generator fleet) to a high of 70 gigawatts (22 percent of the fleet). 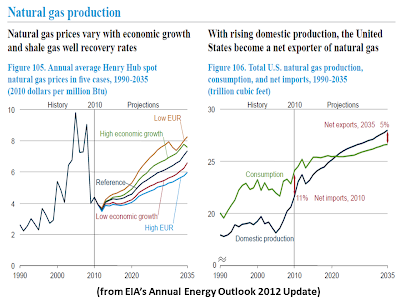 The high end of the range is based on much lower natural gas prices than those assumed in the Reference case; the lower end of the range is based on stronger economic growth, leading to stronger growth in electricity demand and higher natural gas prices. 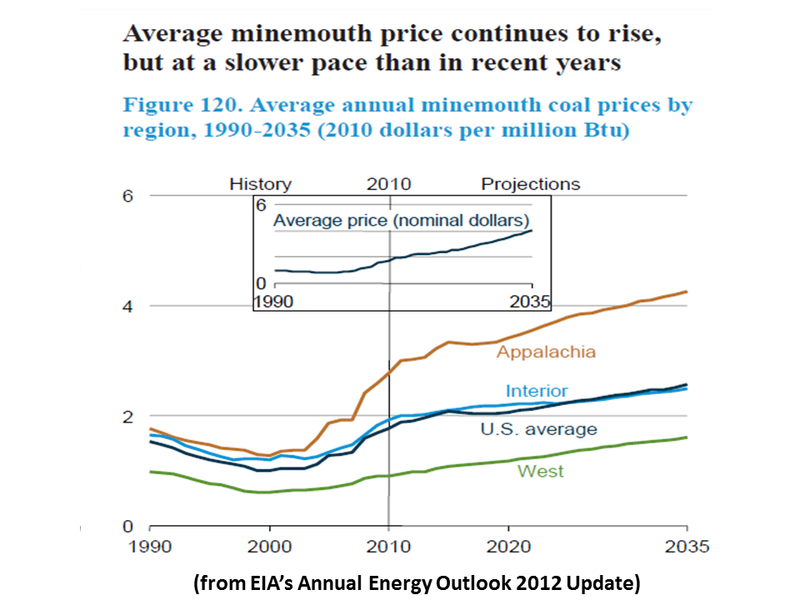 Other alternative cases, with varying assumptions about coal prices and the length of the period over which environmental compliance costs will be recovered, but no assumption of new policies to limit GHG emissions from existing plants, also yield cumulative retirements within a range of 34 to 70 gigawatts. Retirements of coal-fired capacity exceed the high end of the range (70 gigawatts) when a significant GHG policy is assumed (for further description of the cases and results, see “Issues in focus”). 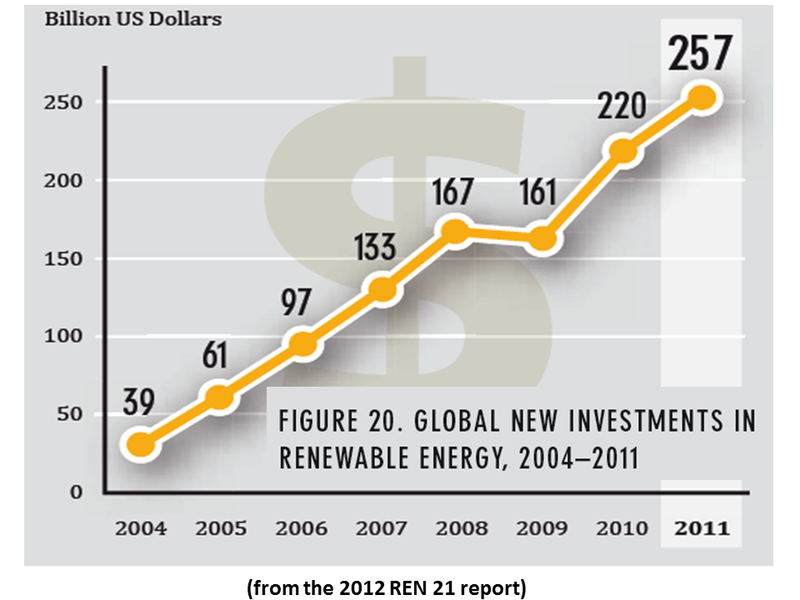 Energy-related carbon dioxide (CO2) emissions grow slowly in the AEO2012 Reference case, due to a combination of modest economic growth, growing use of renewable technologies and fuels, efficiency improvements, slow growth in electricity demand, and increased use of natural gas, which is less carbon-intensive than other fossil fuels. 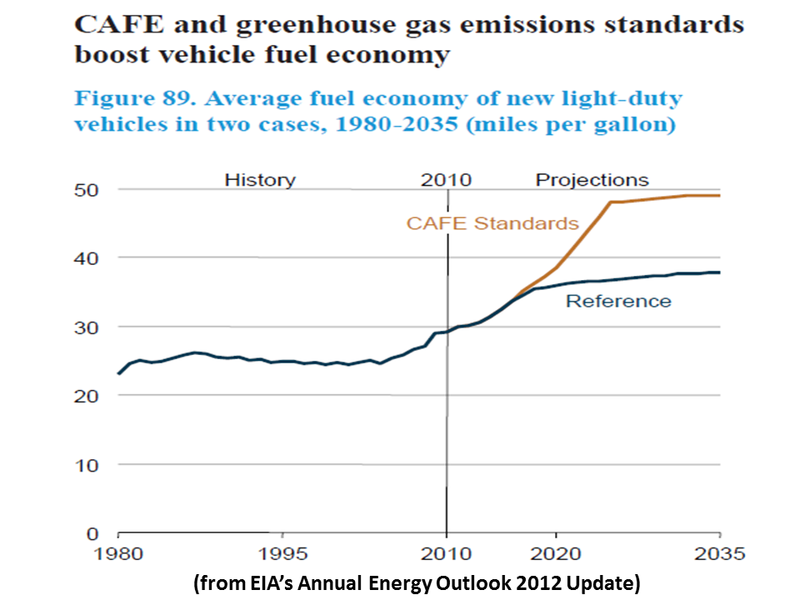 In the Reference case, which assumes no explicit Federal regulations to limit GHG emissions beyond vehicle GHG standards (although State programs and renewable portfolio standards are included), energy-related CO2 emissions grow by just over 2 percent from 2010 to 2035, to a total of 5,758 million metric tons in 2035 (Figure 6). CO2 emissions in 2020 in the Reference case are more than 9 percent below the 2005 level of 5,996 million metric tons, and they still are below the 2005 level at the end of the projection period. 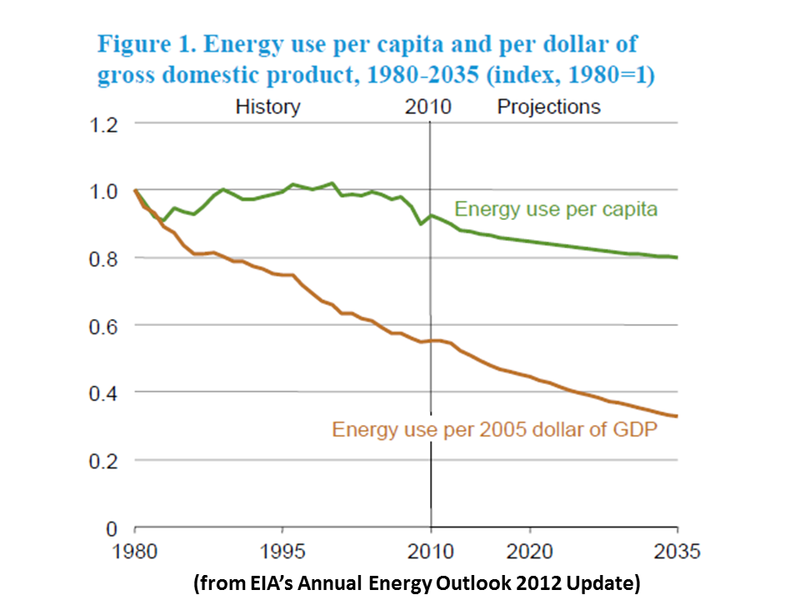 Emissions per capita fall by an average of 1.0 percent per year from 2005 to 2035. Projections for CO2 emissions are sensitive to such economic and regulatory factors due to the pervasiveness of fossil fuel use in the economy. These linkages result in a range of potential GHG emissions scenarios. 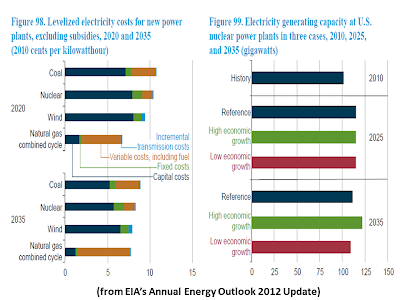 In the AEO2012 Low and High Economic Growth cases, projections for total primary energy consumption in 2035 are, respectively, 100.0 quadrillion Btu (6.4 percent below the Reference case) and 114.4 quadrillion Btu (7.0 percent above the Reference case), and projections for energy-related CO2 emissions in 2035 are 5,356 million metric tons (7.0 percent below the Reference case) and 6,117 million metric tons (6.2 percent above the Reference case). 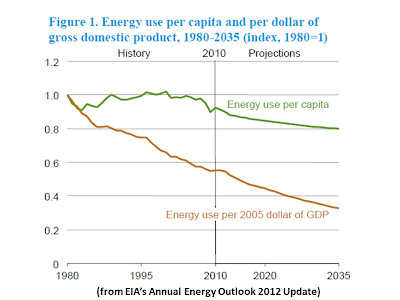 “Since the late 1970s the U.S. has avoided creating a comprehensive energy policy. 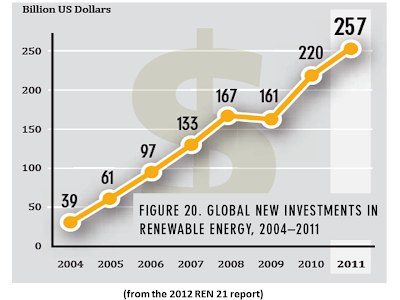 Instead, we have…[p]ermanent tax credits for the fossil fuel industry and temporary credits and subsidies for the renewable energy industry…[T]the Production Tax Credit for wind energy…is set to expire on Dec. 31 unless it is renewed for another two-year run…[Solar’s] 30% investment tax credit sunsets at the end of 2016…It has helped jumpstart a $300 billion solar market…President Obama has proposed eliminating eight permanent oil subsidies that the Cato Institute’s Jerry Taylor estimates will save $43 billion over 10 years. 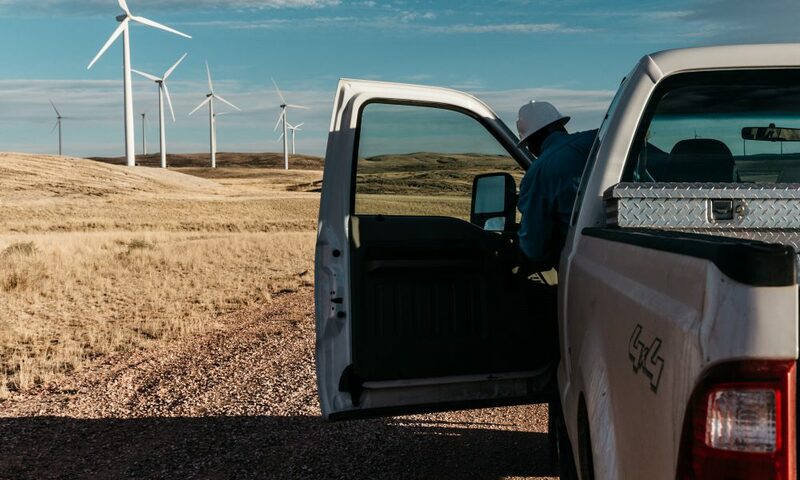 “General Electric, the nation's largest producer of wind turbines, is blaming a drop in orders on the uncertainty surrounding a wind-production tax credit. 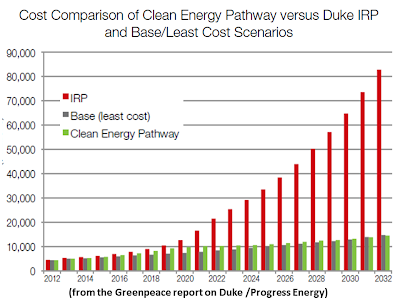 “…[Greenpeace’s] Charting the Correction Course: A Clean Energy Pathway for Duke Energy…details how Duke Energy can save their customers $108 billion over 20 years by investing in renewable energy and energy efficiency. 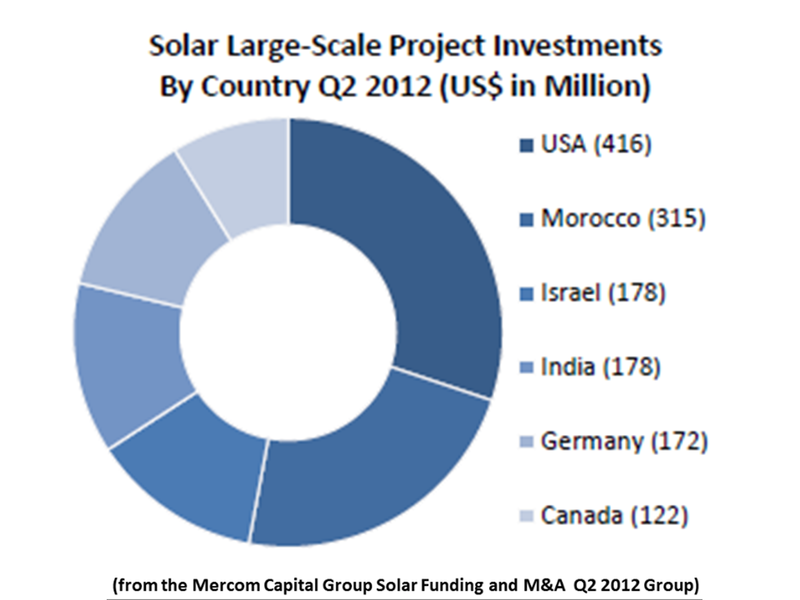 “First Solar Inc…[has made] panel sales to two Indian companies that received $57.3 million in loans from the Export-Import Bank of the United States. “Solar Field Energy Two, based in Mumbai and owned by Kiran Energy Solar Private Power Ltd., was given $23 million for a 20-megawatt project. Mahindra, owned as a subsidiary of Kiran Energy and Mahindra Holding Ltd., was given $34.3 million to build a 20-megawatt system and a 10-megawatt system. 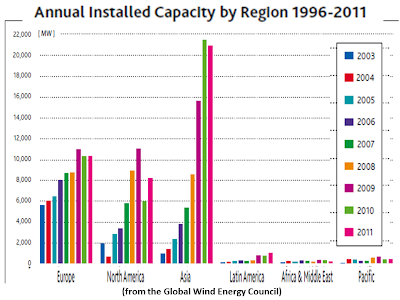 “…[A global order intake for 1H/2012 by] MAKE Consulting…[notes] that wind turbine order intake (MW)…fell by 30% YoY, principally due to weakness in core markets in Asia Pacific and Europe, in particular China, India, UK and Germany (offshore). Regulatory uncertainty, subsidy cuts and grid connectivity issues all contributed to the weakness and offset good growth in new emerging markets. 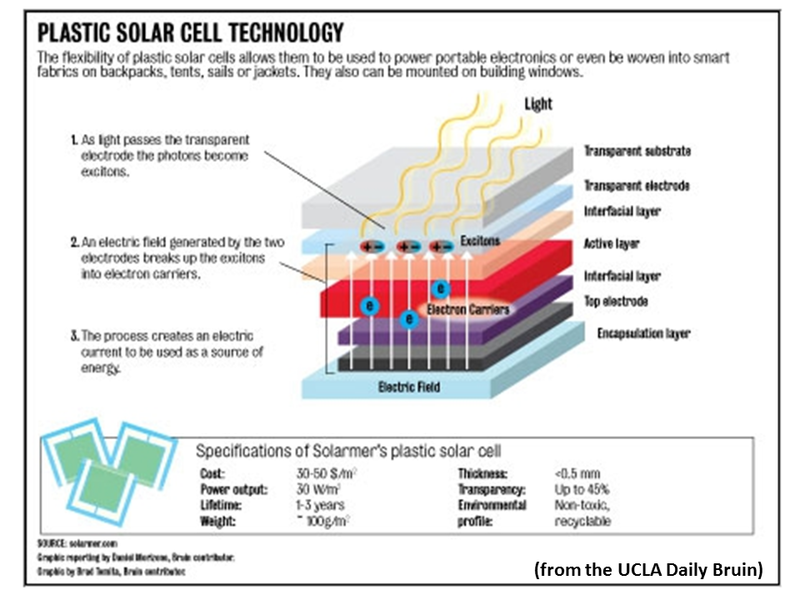 “Leading tier 1 c-Si manufacturers are motivated to implement new technologies in order to increase average cell efficiencies above the levels that can be achieved from idled and mothballed capacity of tier 2 and 3 competitors. 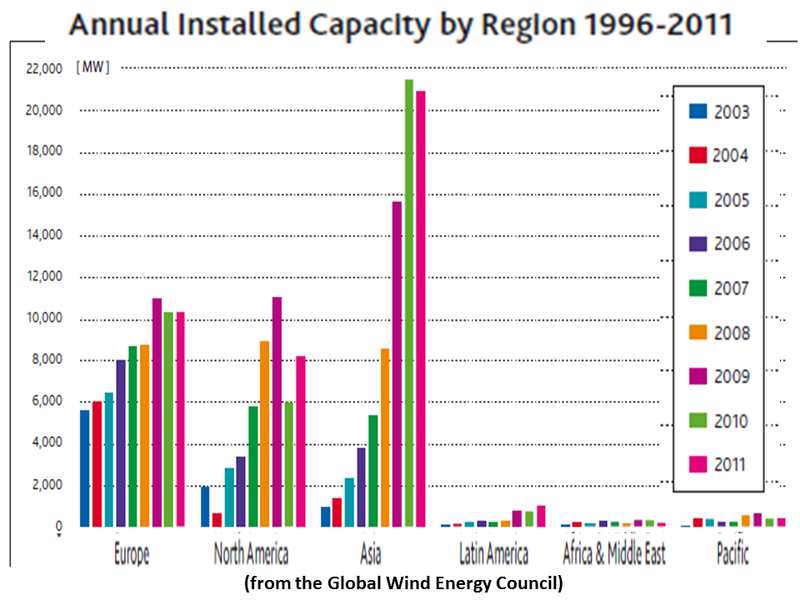 This will effectively consign a considerable quantity of uncompetitive capacity as obsolete and remove its impact on the PV industry supply/demand balance…[T]o prevent a secondary equipment market from emerging, PV equipment suppliers need to act quickly to cannibalize the multi-GW of un-installed tools purchased during the over-spending in 2010 and 2011. 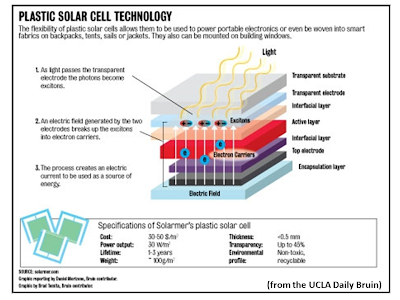 The new PV technology roadmap will greatly assist equipment suppliers in achieving this goal in 2013. “Gamesa says it has reached an agreement to sell three wind farms in France and one in Germany to KGAL GmbH & Co. a German capital asset manager. “…[T] he 16 MW German Sarow wind farm, located in northeastern Germany, is under construction, and will also be equipped with the G90X-2.0 MW turbine. 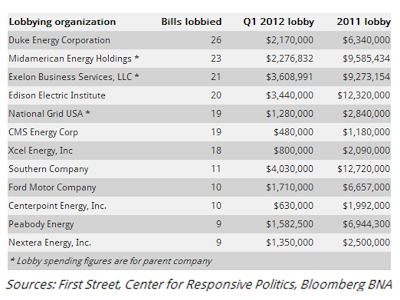 Will the Tea Party Destroy an American Industry to Weaken President Obama? “…[B]usiness and civil leaders…believe that the U.S. has the technological innovation, work force, and resources (including cheap natural gas) to regain our leadership -- if we can get policy right…But…politics is getting ready to reverse the Duluth success story…Wind energy has been one of the fastest growing sectors of the American economy, even during the Recession. 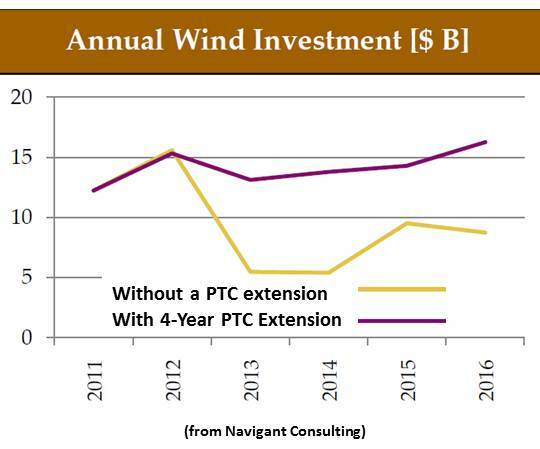 One of the key financing tools for wind developers, the Production Tax Credit, expires at the end of the 2012. 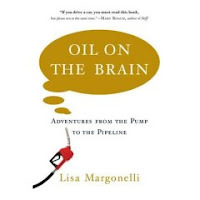 (Equivalent financial mechanisms for coal, oil and gas, of course, do not expire -- they got theirs first.) 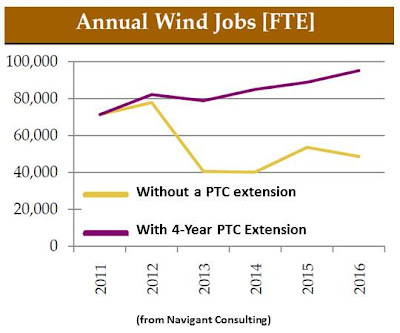 And in spite of bi-partisan support from members of Congress from wind leadership states like Colorado, the Tea Party Republican Leadership seems determined to let the PTC expire to hurt Obama's re-election chances. 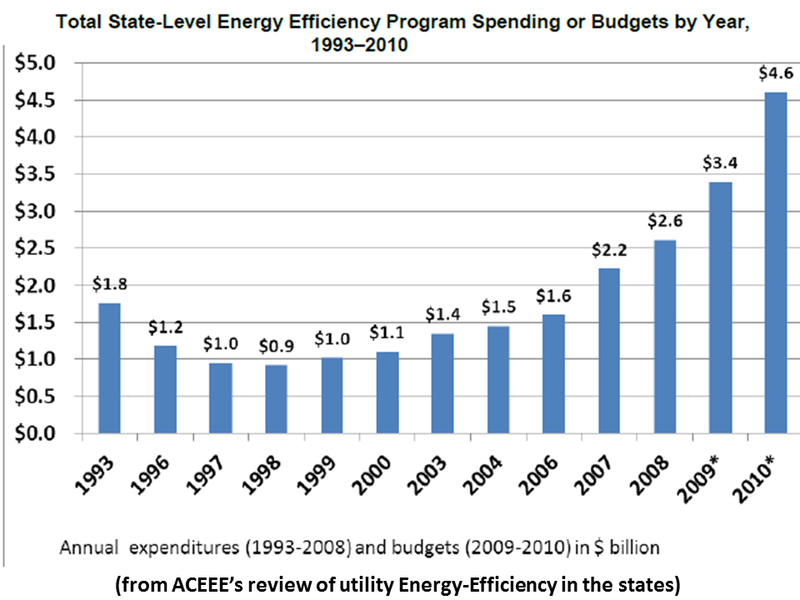 ACEEE Study: States That Spend on Energy-Efficiency May Be Good Bets; Although spending on energy-efficiency programs is uneven across the nation, an ACEEE study shows an overall upward trajectory over the past 30 years, and such spending may help to lure companies to those states with EERS in place. Amazon, Apple, Microsoft, Google, and Yahoo – these global brands and a host of other IT companies are rapidly and fundamentally transforming the way in which we work, communicate, watch movies or TV, listen to music, and share pictures through “the cloud.” The growth and scale of investment in the cloud is truly mind-blowing, with estimates of a 50-fold increase in the amount of digital information by 2020 and nearly half a trillion in investment in the coming year, all to create and feed our desire for ubiquitous access to infinite information from our computers, phones and other mobile devices, instantly. The engine that drives the cloud is the data center. Data centers are the factories of the 21st century information age, containing thousands of computers that store and manage our rapidly growing collection of data for consumption at a moment’s notice. These cloud data centers, many of which can be seen from space, consume a tremendous amount of electricity; some consume the equivalent of nearly 180,000 homes. 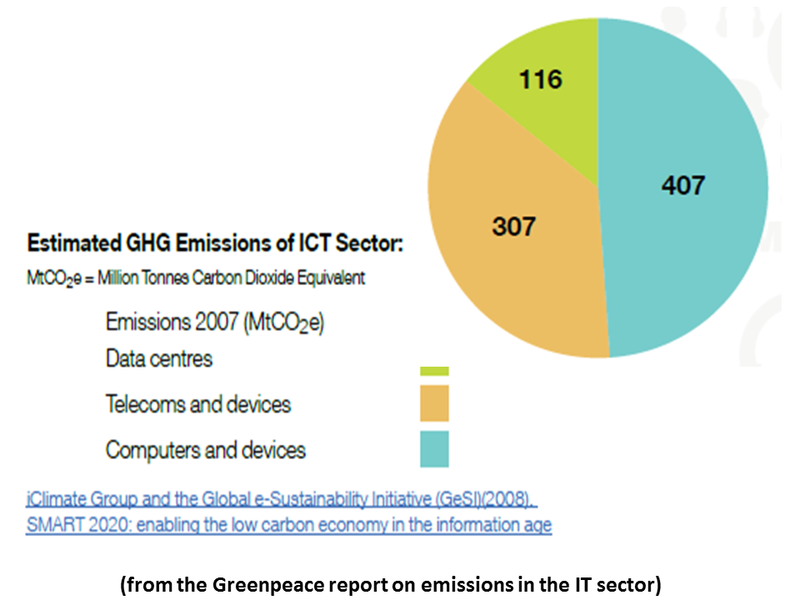 Unfortunately, despite the tremendous innovation they contain and the clean energy potential they possess, most IT companies are rapidly expanding without considering how their choice of energy could impact society. Given the energy-intensive nature of maintaining the cloud, access to significant amounts of electricity is a key factor in decisions about where to build these data centers. Since electricity plays a critical role in the cost structure of companies that use the cloud, there have been dramatic strides made in improving the energy efficiency design of the facilities and the thousands of computers that go inside. However, despite significant improvements in efficiency, the exponential growth in cloud computing far outstrips these energy savings. Companies must look not only at how efficiently they are consuming electricity, but also the sources of electricity that they are choosing. This year’s report provides an updated and expanded look at the energy choices some of the largest and fastest growing IT companies are making as the race to build the cloud creates a new era of technology. These energy choices are completely invisible to consumers as we continue to rely more and more on our online world, but in places where the cloud touches the ground, these investments are having a very significant and rapidly growing impact in the offline world. Instead of linking their IT innovation to equally innovative clean sources of electricity, many IT companies are simply choosing to attach their modern information factories to some of the dirtiest sources of electricity, supplied by some of the dirtiest utilities on the planet. 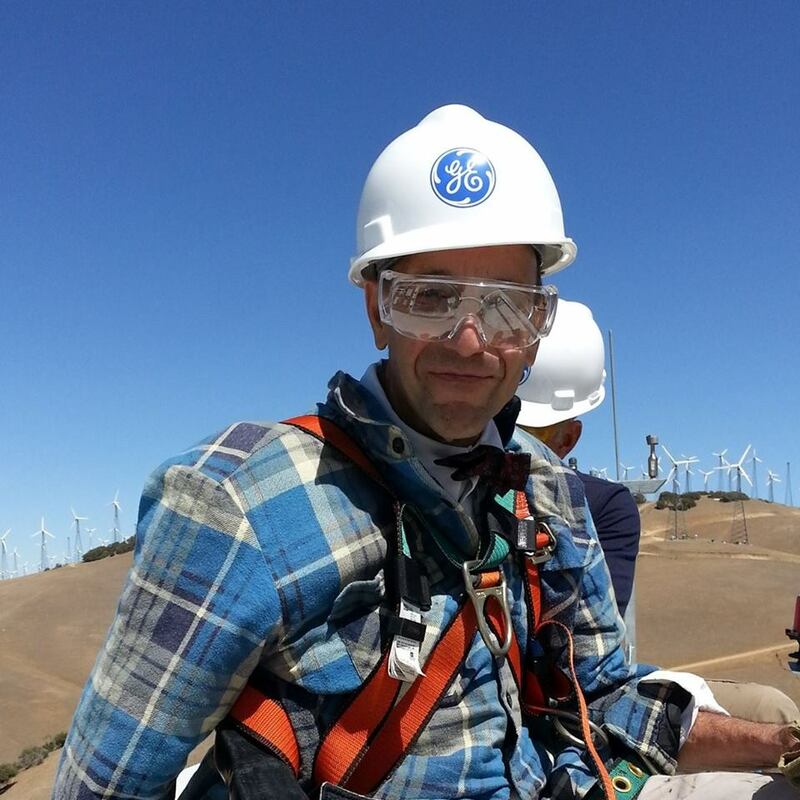 These utilities, unlike the IT companies, are not known for their innovation. 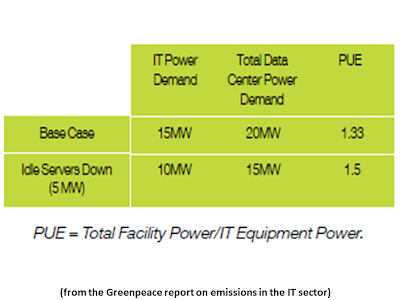 Because of the tendency within the IT sector to cluster in the same geographic locations, these investments are driving significant new demand for both coal and nuclear power in many regions of the world – and in rapidly growing economies like India, they are driving demand for diesel from large onsite generators. If IT companies continue to rely on dirty sources of energy to power the cloud, the cloud itself will begin to have a measurable negative impact on our environment and communities. However, we do see a growing realization and commitment from within several leading IT companies to realign their rapid growth with access to renewable sources of electricity at scale to power their online platforms. For these companies, we see these commitments significantly shaping decisions on where they build their data centers. Companies such as Google are also making significant clean energy investments and signing long-term contracts for renewable energy to power their existing facilities. 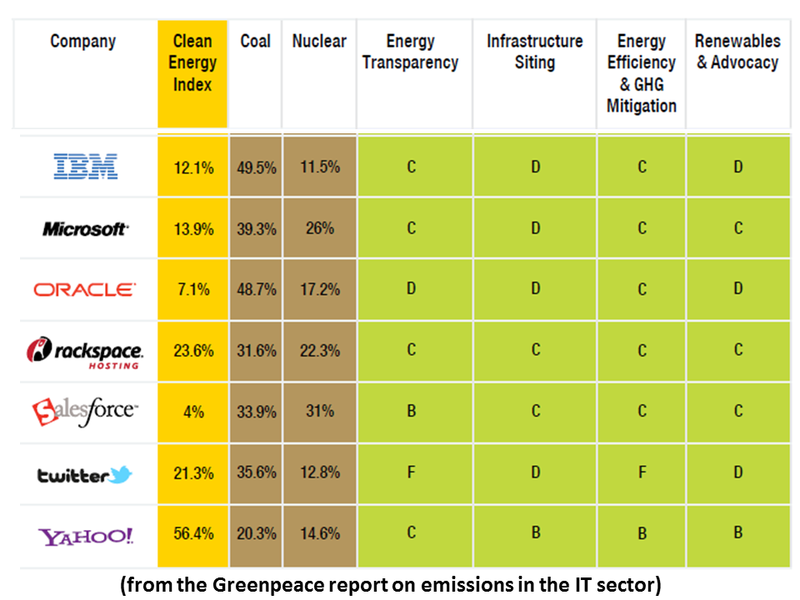 Even more significantly, many IT companies are recognizing that their influence and market power give them the opportunity and responsibility to demand clean energy investments and policy conditions to drive utilities and government officials to make better choices. IT companies can drive the electricity supply on the grid we all use to ever increasing amounts of renewable energy while phasing out the dirtiest and most dangerous sources. With this year’s update, we have expanded our analysis to examine a total of 14 global IT companies who are leading the sector’s move to the cloud, and also taken a closer look at the key places around the globe where significant concentrations of data centers are being built. We explore the challenges and opportunities for IT companies to play a constructive role in driving renewable energy deployment. 1. Three of the largest IT companies building their business around the cloud – Amazon, Apple and Microsoft – are all rapidly expanding without adequate regard to source of electricity, and rely heavily on dirty energy to power their clouds. 2. 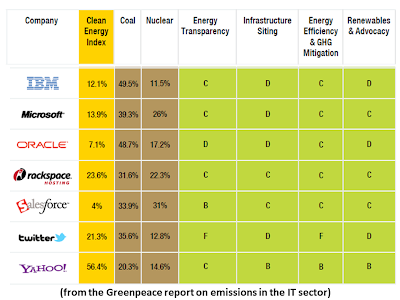 Yahoo and Google both continue to lead the sector in prioritizing access to renewable energy in their cloud expansion, and both have become more active in supporting policies to drive greater renewable energy investment. 3. Facebook, one of the largest online destinations with over 800 million users around the world, has now committed to power its platform with renewable energy. Facebook took the first major step in that direction with the construction of its latest data center in Sweden, which can be fully powered by renewable energy. 4. 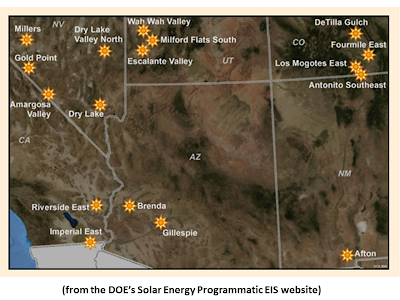 A growing concentration of data center investments in key locations is having a significant impact on energy demand and how the electricity grid is managed; if such concentrated expansion is allowed to continue, this will make it increasingly difficult to shift these investments and the surrounding community away from dirty sources of electricity. 5. 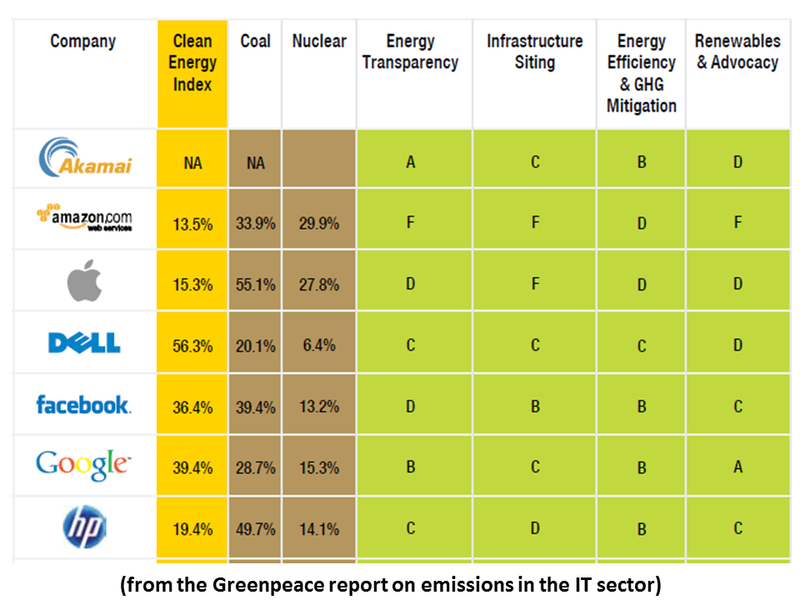 Akamai, responsible for carrying a tremendous amount of internet traffic, is the first IT company to begin reporting its carbon intensity under the new Carbon Utilization Effectiveness (CUE) standard. There has been a notable absence of reporting under CUE by other companies. 6. 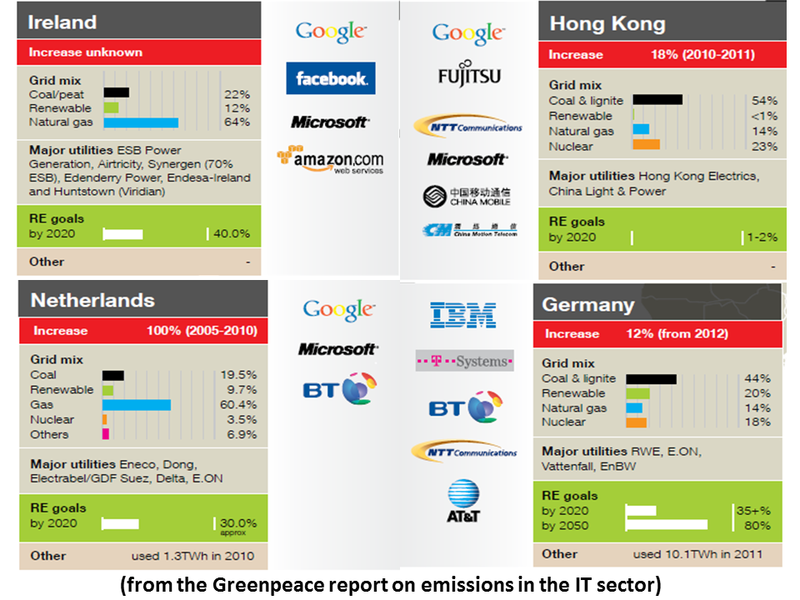 There have been increasing attempts by some companies to portray the cloud as inherently “green,” despite a continued lack of transparency and very poor metrics for measuring performance or actual environmental impact. 8. 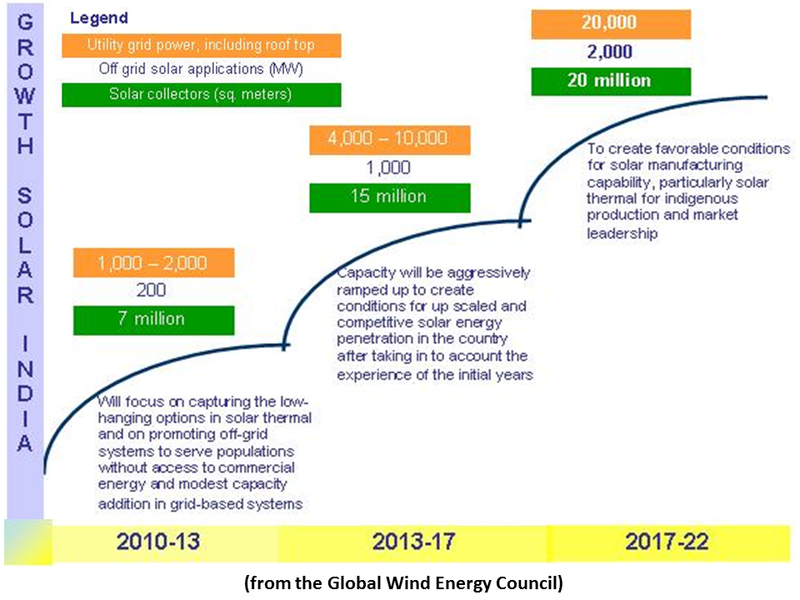 There have been increasing signs that more IT companies are beginning to take a proactive approach in ensuring their energy demand can be met with available renewable sources of electricity, and will increasingly play a role in shaping our energy future. 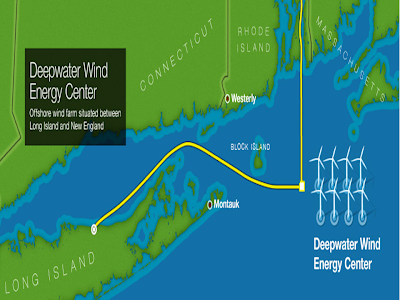 “Record-high temperatures along the East Coast in recent weeks have spurred conversation about the availability of electric capacity during peak usage…Deepwater Wind this week released data showing that its planned Deepwater Wind Energy Center (DWEC), a 900-MW offshore wind farm that would be located 20 miles off the coasts of Massachusetts and Rhode Island, would reach maximum output on the hottest days of summer in the Northeast, just when electric grids most need the energy. “…While [Deepwater Wind’s] wind farm is projected to produce at an average of approximately 45 percent capacity over the course of a full year, it would have been producing much more, in the range of 65-90 percent capacity, during most of the hottest hours of the heat wave…Another Northeast developer, Cape Wind, has pointed to similar data from its wind measurement instruments during heat waves. 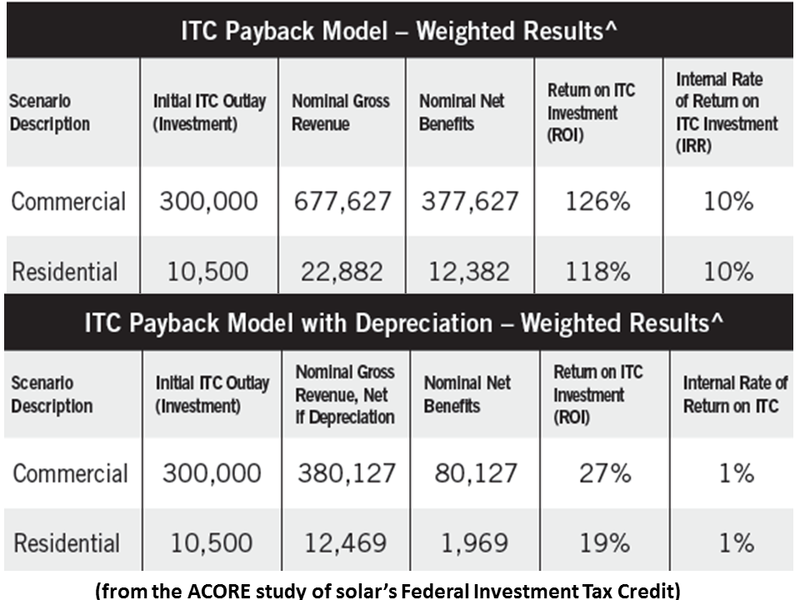 “The solar investment tax credit (ITC) can deliver a 10% internal rate of return to taxpayers on the U.S. government's initial investment, according to [Paid In Full; An Analysis of the Return to the Federal Taxpayer for Internal Revenue Code Section 48 Solar Energy Investment Tax Credit (ITC)] published by the U.S. Partnership for Renewable Finance (PREF), a program of the American Council On Renewable Energy (ACORE). 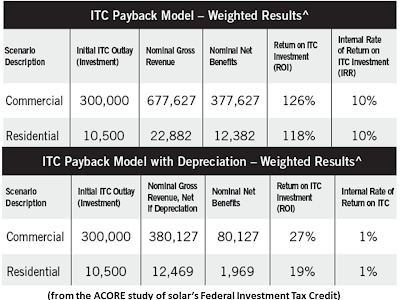 “SolarCity, a member of PREF, created the models for the study based on industry data and consulted with tax and advisory firm KPMG on the application of current income tax law and evaluation methodology for federal government incentives…"
[Lyndon Rive, CEO, SolarCity:] "Everyone understands that solar power leads to cleaner air and greater independence from fossil fuel…Far fewer people realize that solar incentives can pay for themselves. 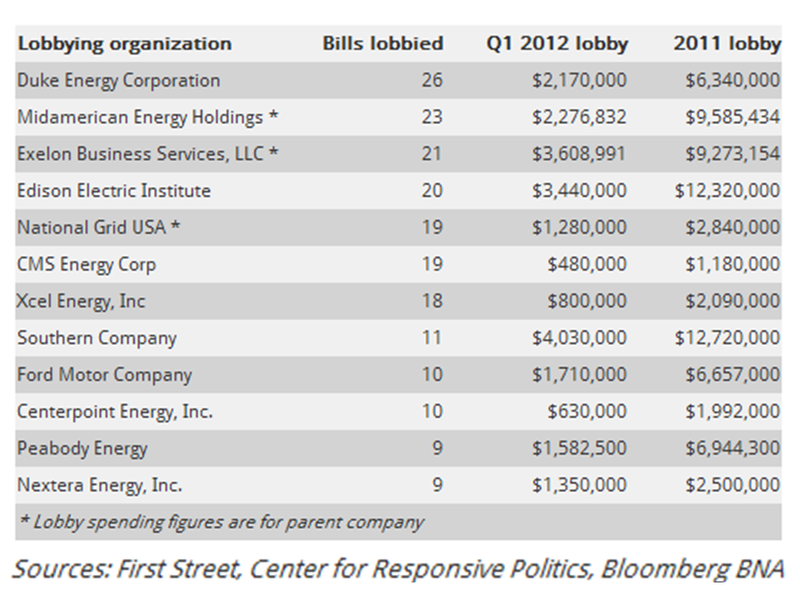 Solar power has become a political football in this election year, but the investment tax credit has been one of the most beneficial, bipartisan energy policies of this or any other generation." 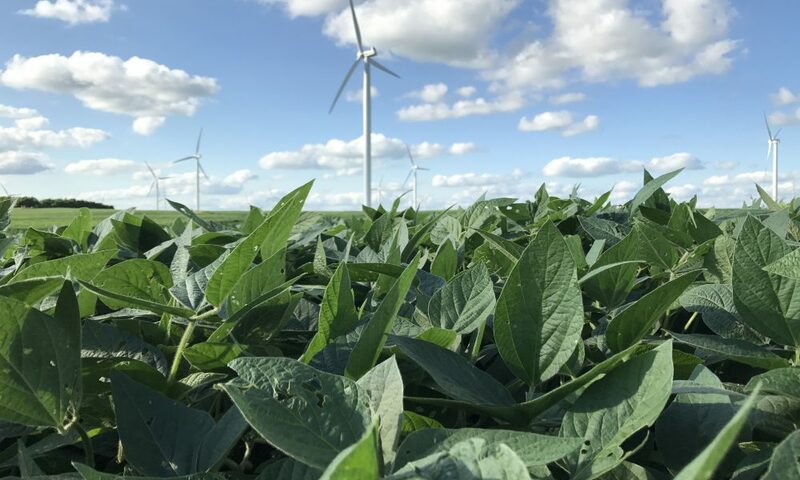 “The Lempster Wind Power Project’s 12 turbines produce enough energy (up to 24 megawatts) to power 10,000 homes and offset the carbon dioxide emissions equivalent to 5,700 cars annually. 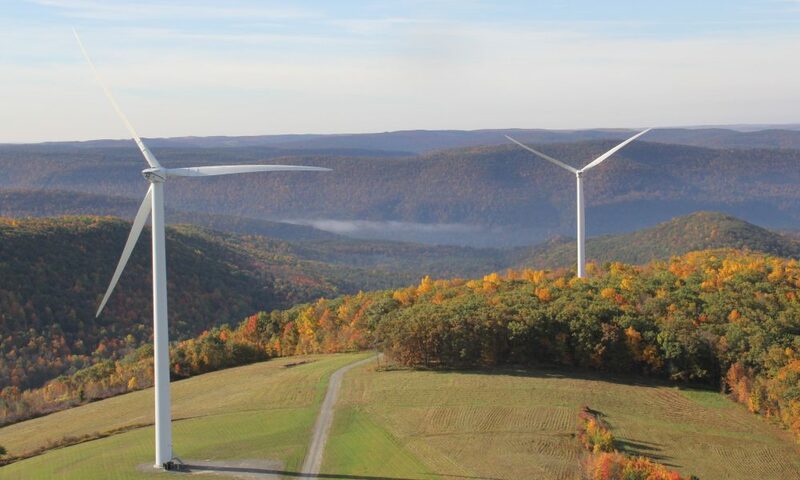 Each turbine tower stands 256 feet tall, supporting a 139-foot turbine blade, making the total height 395 feet when the blade is vertical to the ground. 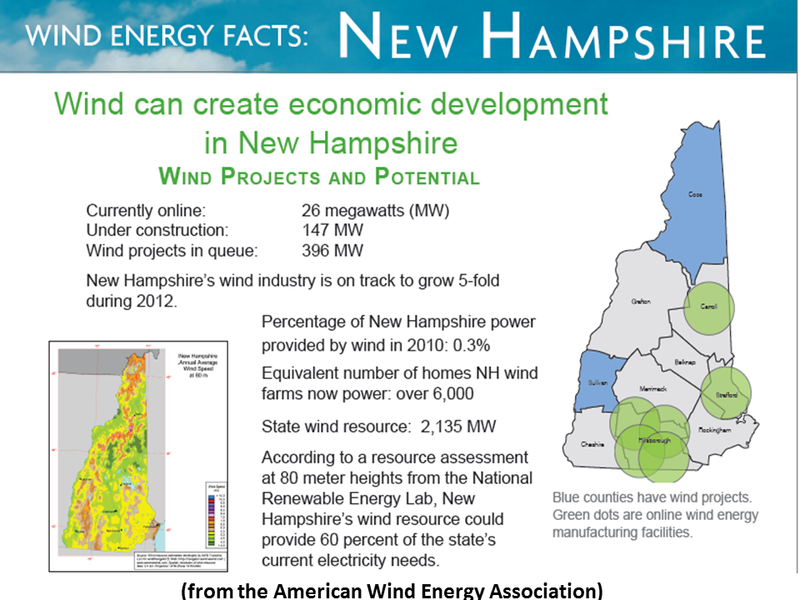 Lempster is owned by the Iberdrola Renewables company…Public Service of New Hampshire buys all of Lempster’s power, which is then resold to the New Hampshire Electric Cooperative. 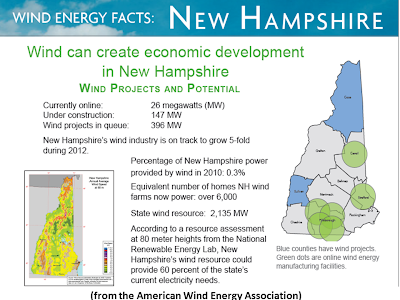 “Granite Reliable Power Windpark in Coos County was purchased by Brookfield Renewable Energy in February 2011…Brookfield hopes to boost its wind portfolio to have an installed capacity of more than 600 megawatts by the end of 2012. Granite Reliable has a stated output of 99 megawatts…The Antrim wind farm is still in the permitting process [and is expected to break ground about 2014]…One of the state’s first wind farms, Loranger Power Generation in Berlin, was commissioned in 2006. 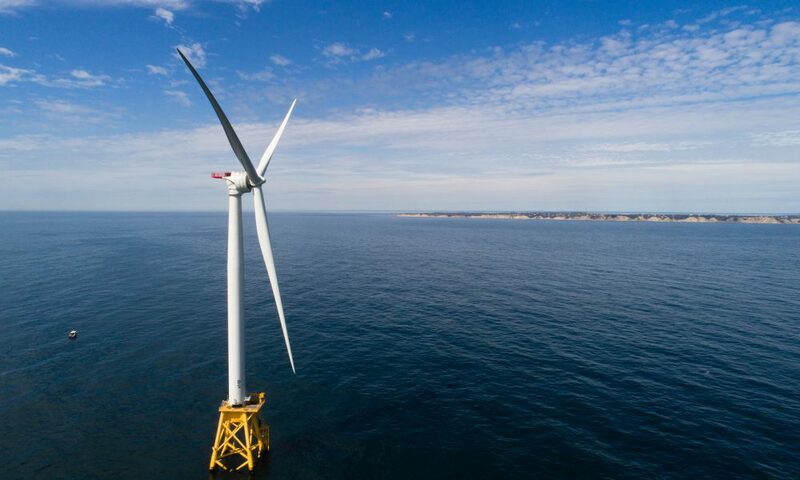 It is capable of producing about 1.35 megawatts of power…The power generated at Loranger comes from three turbines and is returned to the state’s power grid by Public Service of New Hampshire. Venture capital (VC) funding in the solar sector was slighly up in Q2 2012 with $376 million in 32 deals compared to $329 million in 34 deals in Q1 2012. 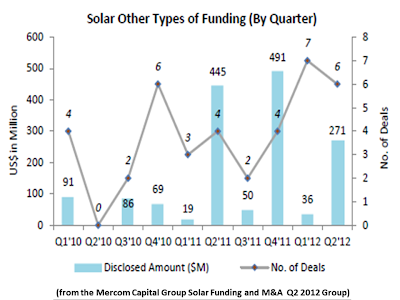 With news of solar companies downsizing or going out of business seemingly every day, continued steady VC funding is good news. 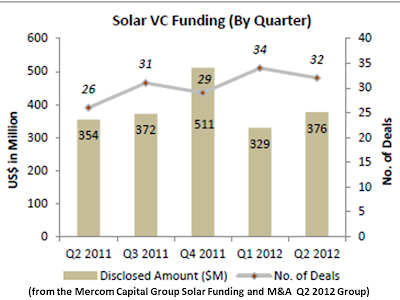 That said, the average VC deal size has been consistently dropping since 2010 with large VC deals becoming rare. 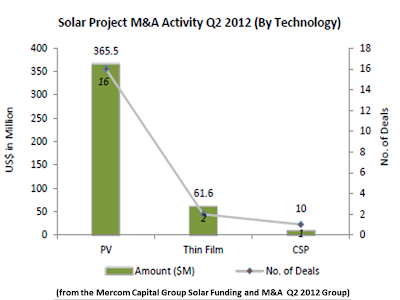 CIGS and solar lease companies continue to be popular with investors. 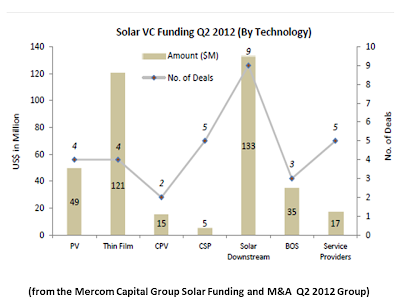 Top VC deals in Q2 included CIGS company Nanosolar with $70 million and solar lease company SunRun with $60 million. 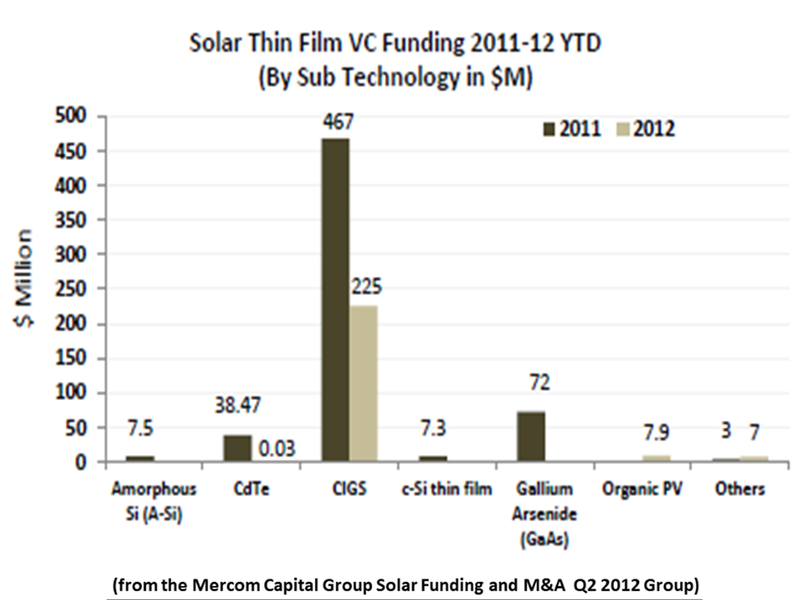 At the end of the first half of 2012, solar downstream companies are slightly ahead in VC funding with $251 million compared to $239 million raised by CIGS companies. 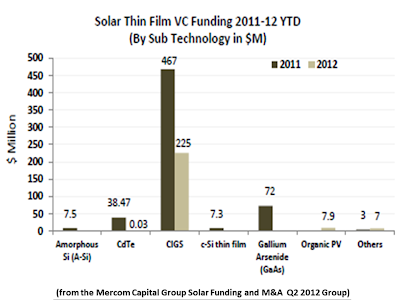 Since 2011, most solar VC investments have gone to thin film companies with $835 million, and with panel prices falling more than 60 percent over the same period, solar downstream companies have been an attractive play. 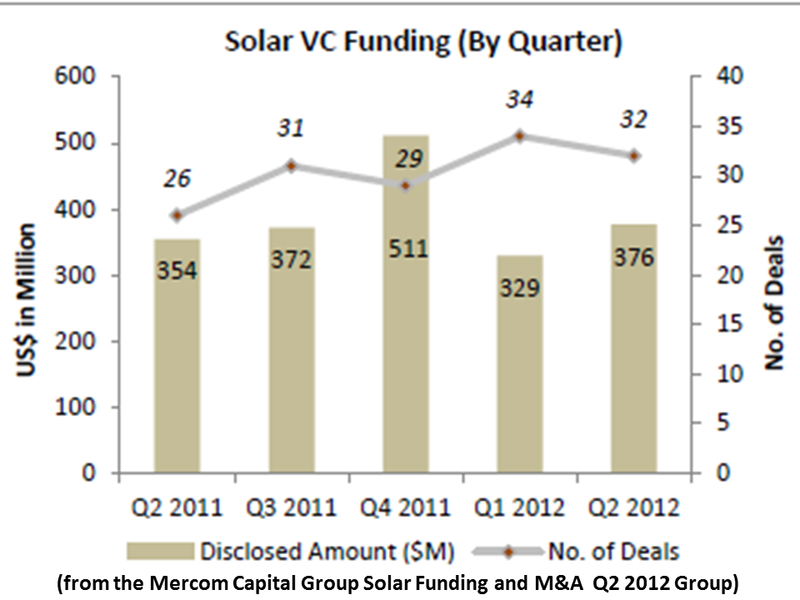 In this quarter we are finally seeing VC investments catch up, with downstream receiving the most funding. Balance-of-system (BOS) companies also represent a significant opportunity for investment, innovation and cost reduction. 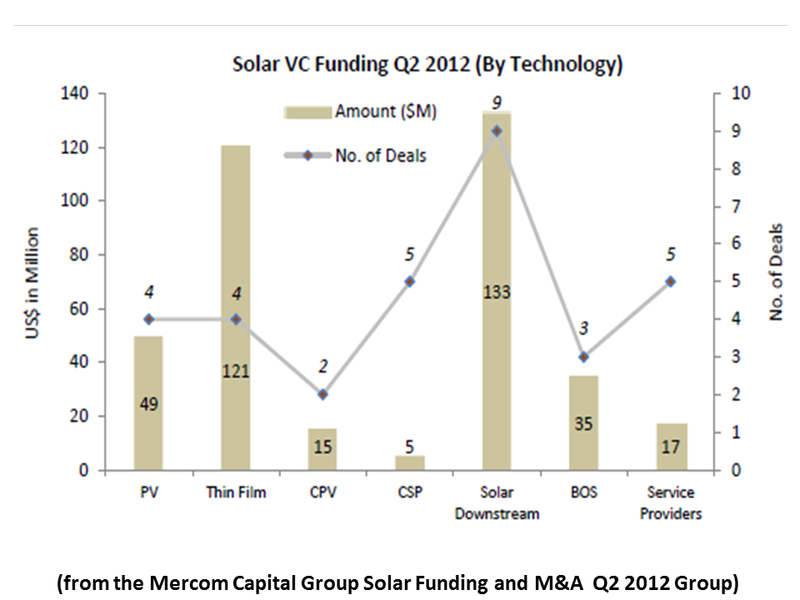 With the fall in PV prices, BOS is now the largest slice of the solar system pie, but VC investments in BOS have been surprisingly low. A total of 60 VC and Private Equity (PE) investors participated in 32 deals in Q2, with Crosslink Capital, Kleiner Perkins Caufield and Byers and the International Finance Corporation’s (IFC) VC/PE arm participating in multiple deals. 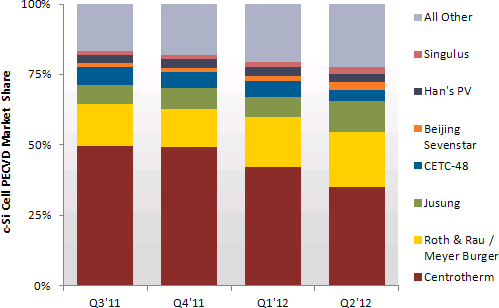 There were 14 M&A transactions in Q2 2012 totaling $325 million, with only six disclosing transaction amounts. 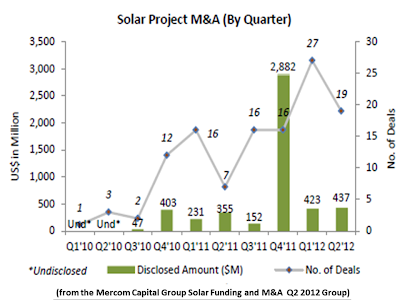 In comparison, Q1 2012 saw 14 M&A transactions totaling almost $5 billion, although $4.7 billion of that was the Solutia acquisition. This quarter, most of the M&A activity were small strategic transactions with a few of them being acquisitions of business divisions for synergistic reasons. Some of the acquisitions were for “sick” companies getting rid of non-strategic businesses and assets. 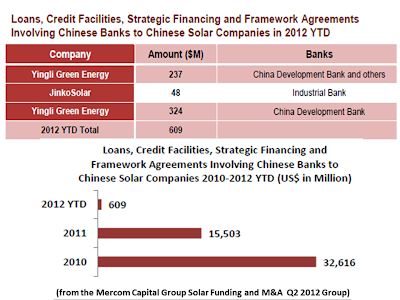 The largest disclosed transaction was the $276 million acquisition of Chinese mono and polycrystalline ingot maker Zhejiang Topoint Photovoltaic by Chinese firm Guangxi Beisheng Pharmaceutical. 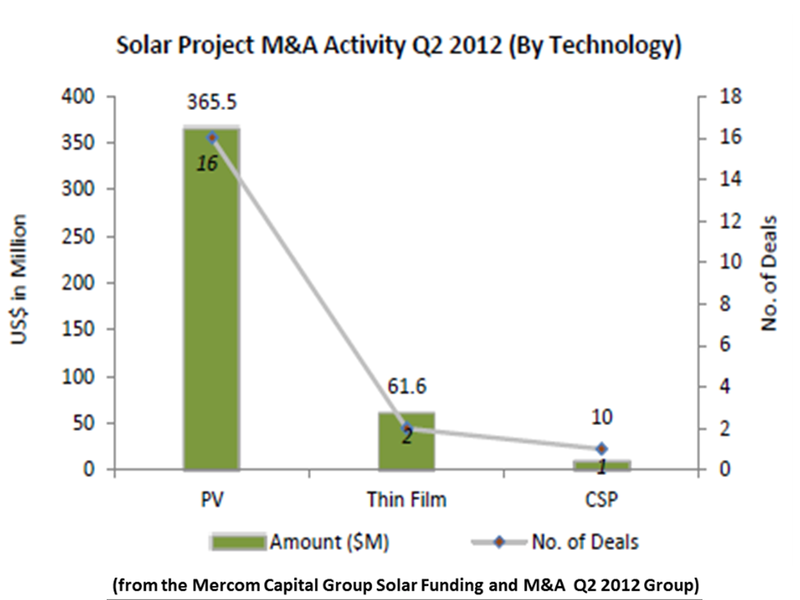 M&A activity in Q2 2012 involved eight manufacturers, five solar downstream companies and one thin film company. 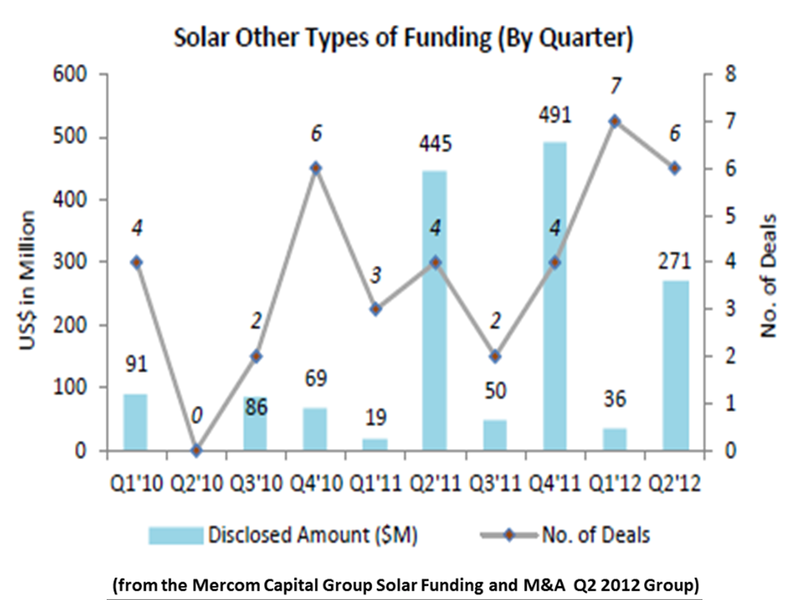 There were 13 new cleantech and solar-focused investment funds announced this quarter, commiting a total of $3.2 billion. We also tracked 13 bankruptcies and insolvencies in Q2, and seven of the 13 were thin film companies. There were 16 companies that announced restructuring and downsizing in this quarter. 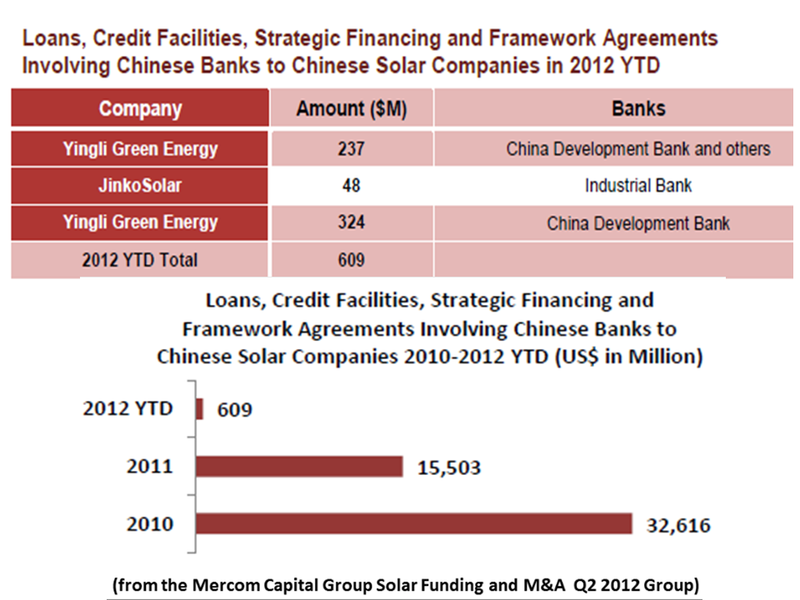 Some major bankruptcy announcements included Q-Cells, Abound Solar, Solar Trust of America and Konarka Technologies among others. 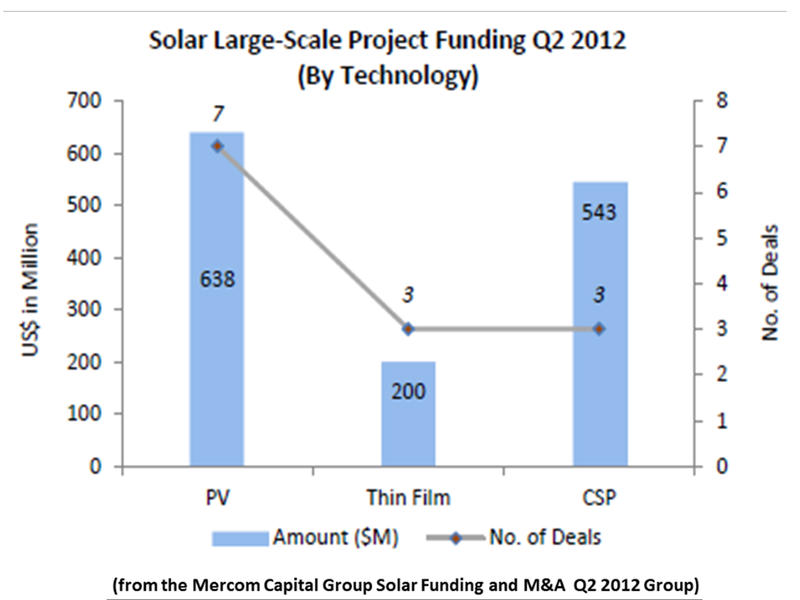 Downstream companies have been the most favored among VC investors in 2012, receiving $251 million in funding so far in 17 deals, followed by thin film companies with $239 million in 11 deals. With solar manufacturing in trouble from overcapacity and price pressures, there is a natural shift toward downstream companies. 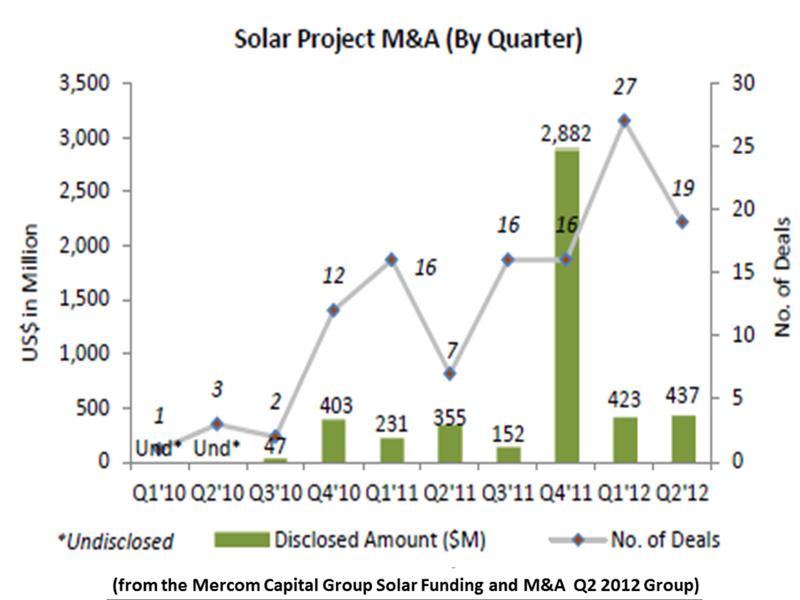 The solar lease model especially continues to be attractive, led by SolarCity’s $81 million raise in Q1 and SunRun’s $60 million raise this quarter.